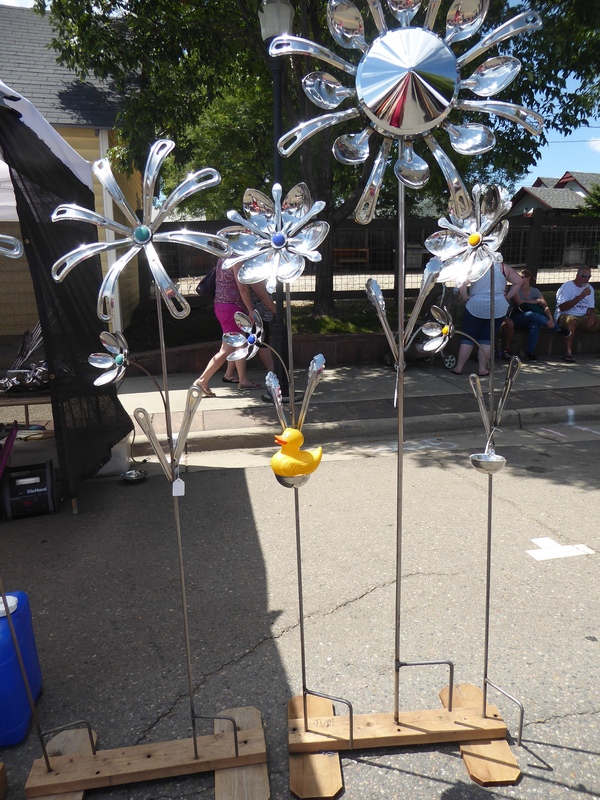 I, Zeb the Duck, enjoyed Denver’s Art and Music Festival at Sloan’s Lake. Mom and I listened to Steve Werges play the guitar and sing. 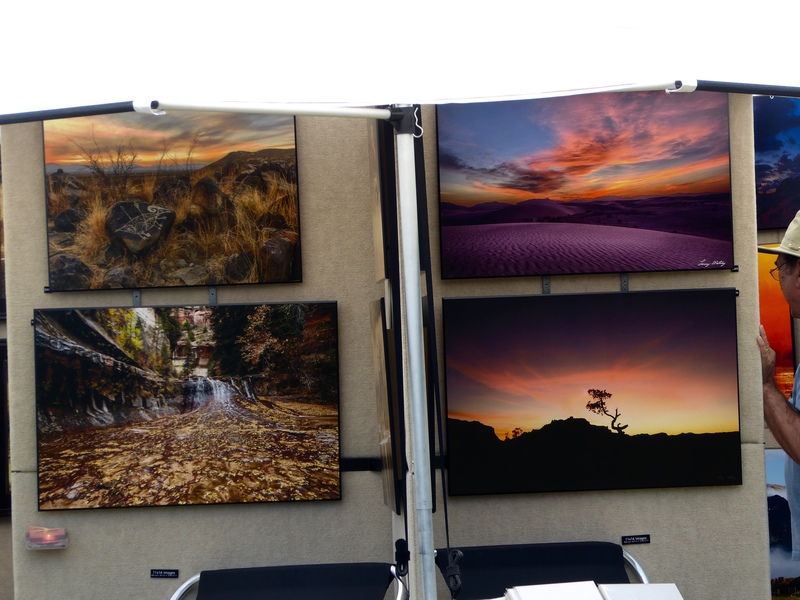 Walking around the festival, we admired these photographs. Aren’t they great? 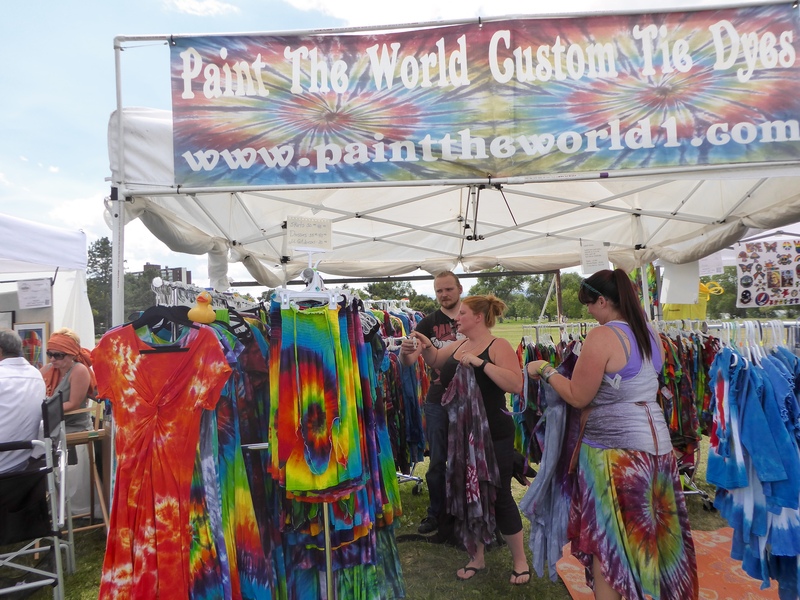 Paint The World Custom Tie Dyes had lots of stuff. but mom did not bring any home. We talked to Keith of Lars Metal Art and admired his pictures. These are made of metal. Many are copper that he pounds from the back. 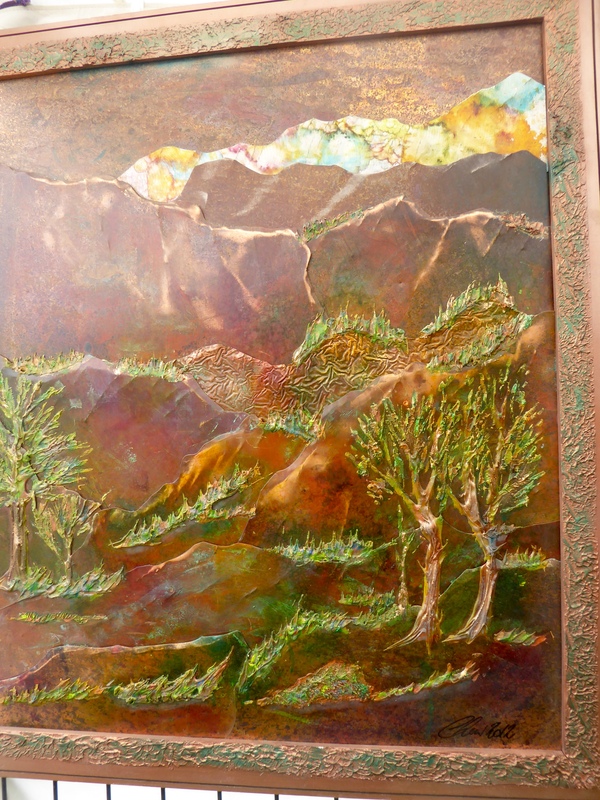 This one is multiple layers of copper to show depth. He also designs and mounts backsplashes and doors for your home. His art is amazing. Visit http://www.larsmetalarts.com We really like it and we like Keith. 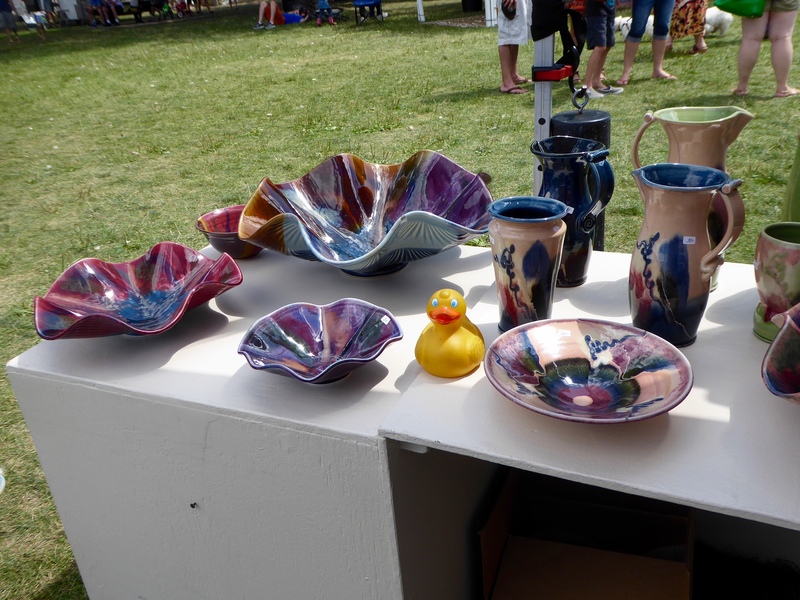 These bowls are porcelain pottery. 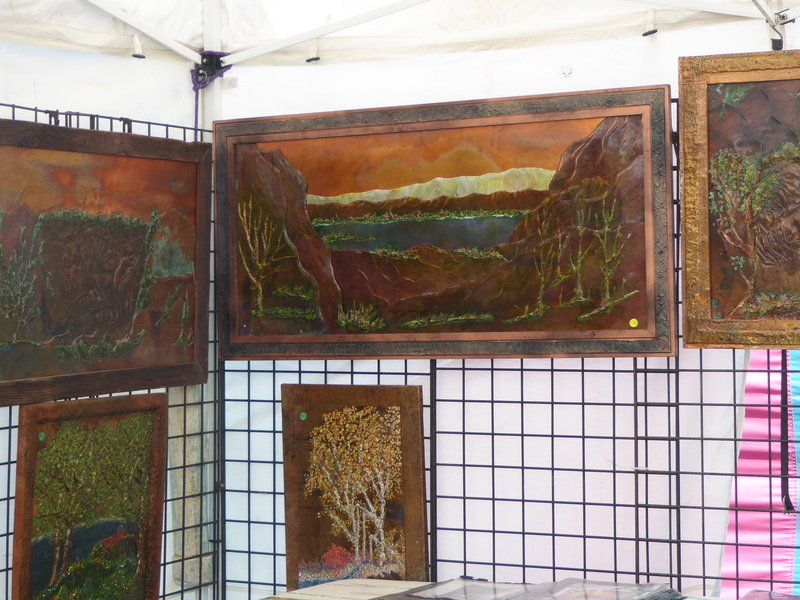 These are made in Pine, Colorado (about 45 miles from Denver). 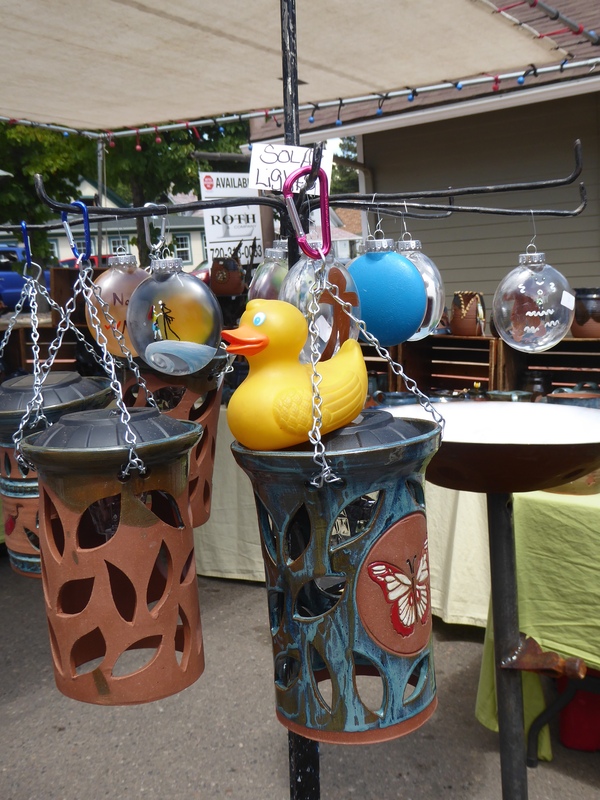 The artist said the bowls are very nice filled with water and floating candles. Next we admired granite serving platters from Rough Around the Edge. 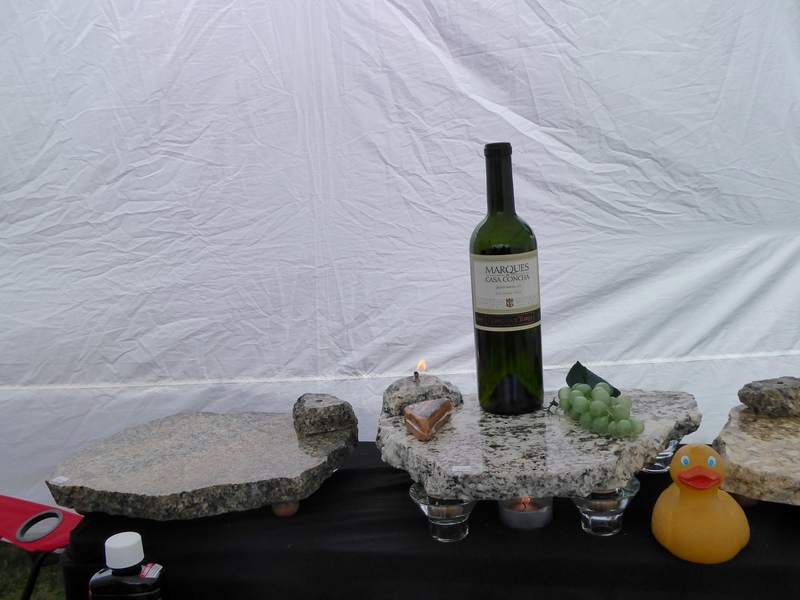 Visit http://www.RoughAroundTheEdge.com The granite can be heated or cooled and will hold the temperature for hours. These great trays are attractive and also very useful. Many also have small candle holders. The wick will never burn out and the small reservoir is fill with oil that burns. Very nice! 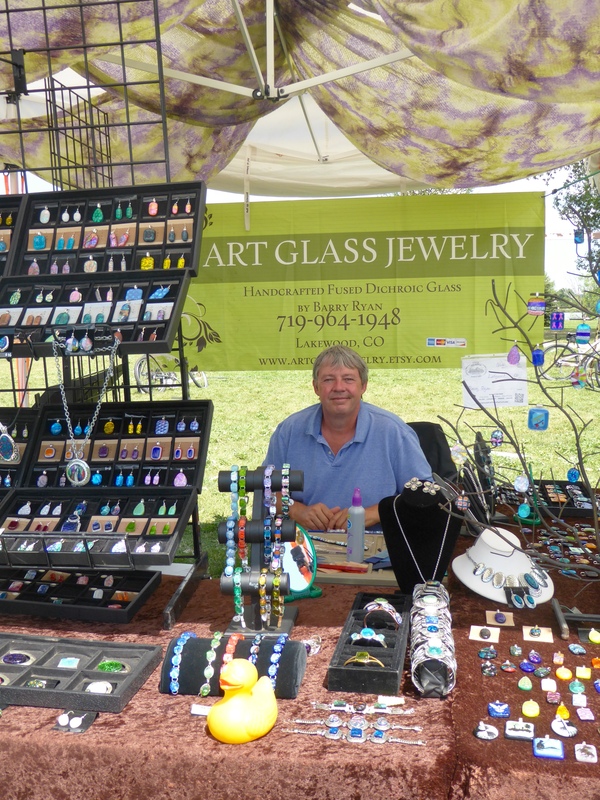 This is Barry from Art Glass Jewelry. 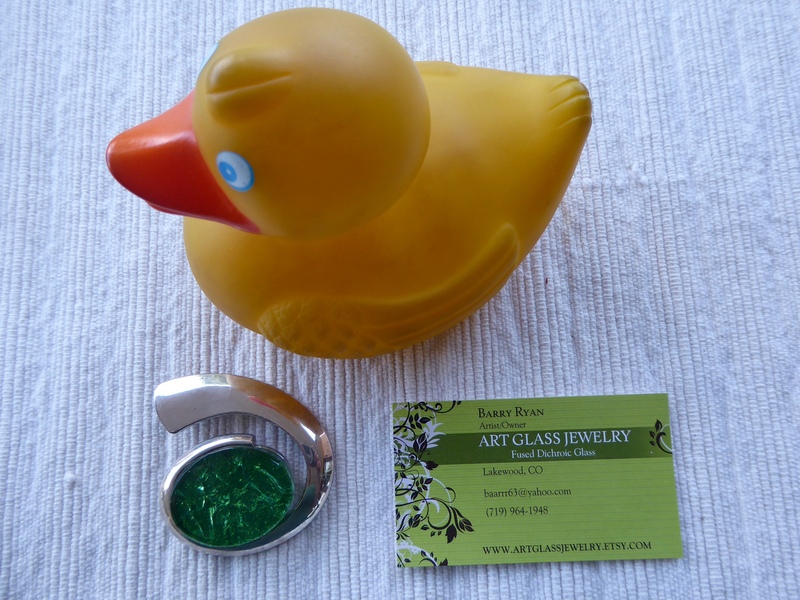 His jewelry is made of layers of fused glass. Visit him at http://www.ArtGlassJewelry.etsy.com Mom just couldn’t resist. This pendant now lives at our house. It really is pretty. Cliff of CSimmons Fine Art & Photography Studio takes great photographs and then makes painting from the photos. 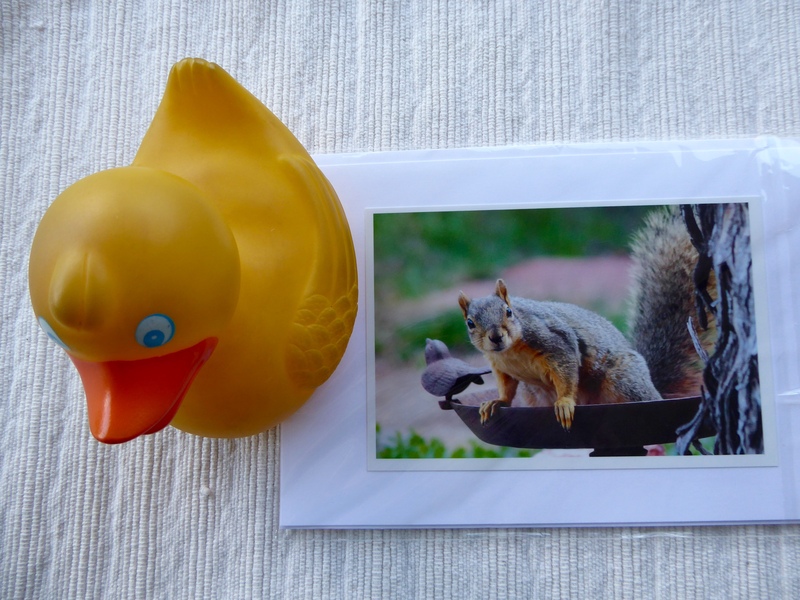 He also makes cards with some photos. We loved this squirrel. He is just like the ones in our yard. Visit Cliff on Facebook at cliff@csimmonsartstudio.com So this greeting card came home with us also. As we were leaving, we saw all these tall sculptures. I like them! 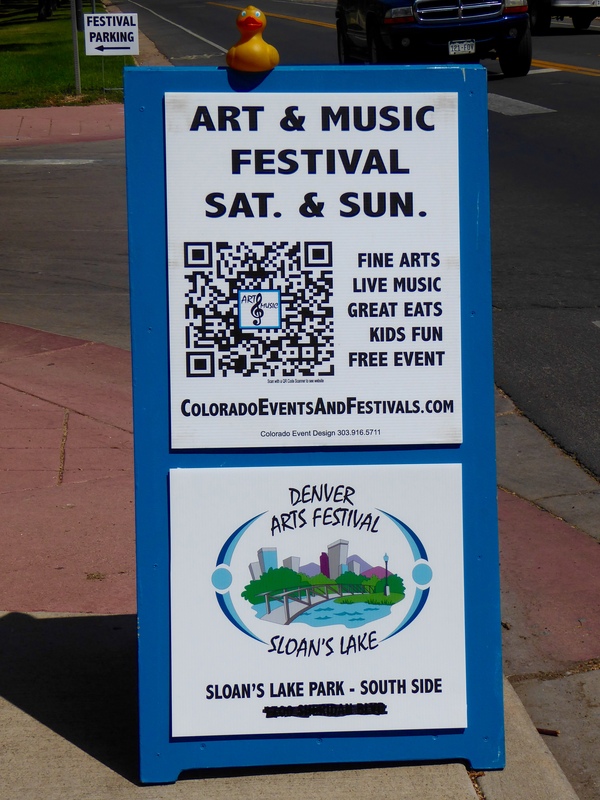 And, in case you were wondering, this festival was at Sloan’s Lake in Denver, and there really is a lake here. 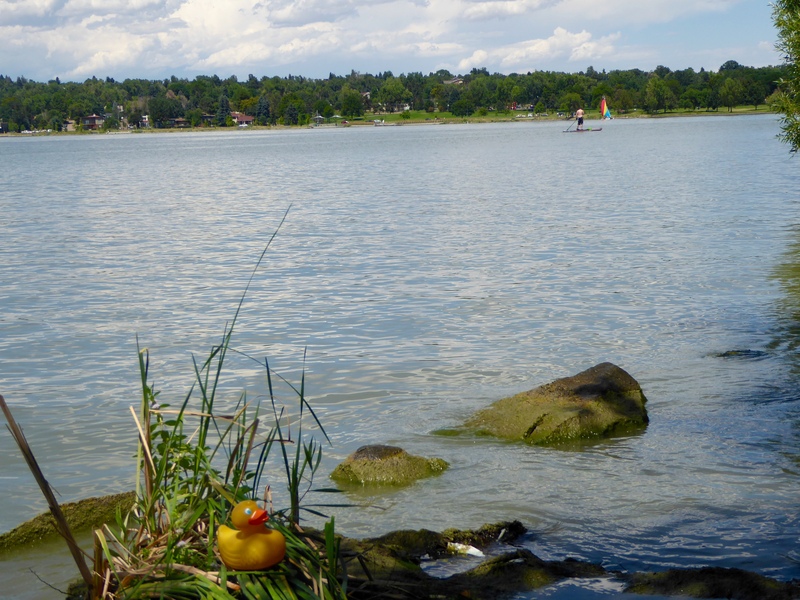 It is a rather large lake with a sidewalk trail for hiking. 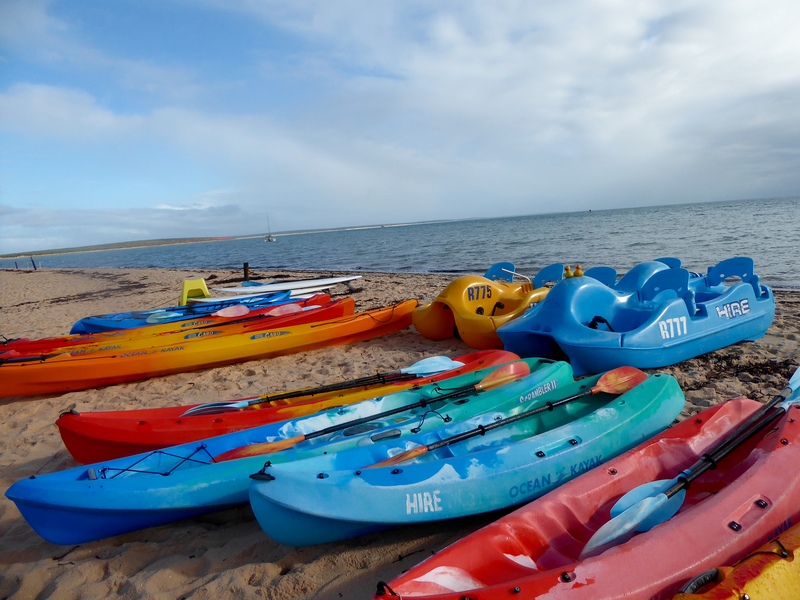 Water sports are here also. 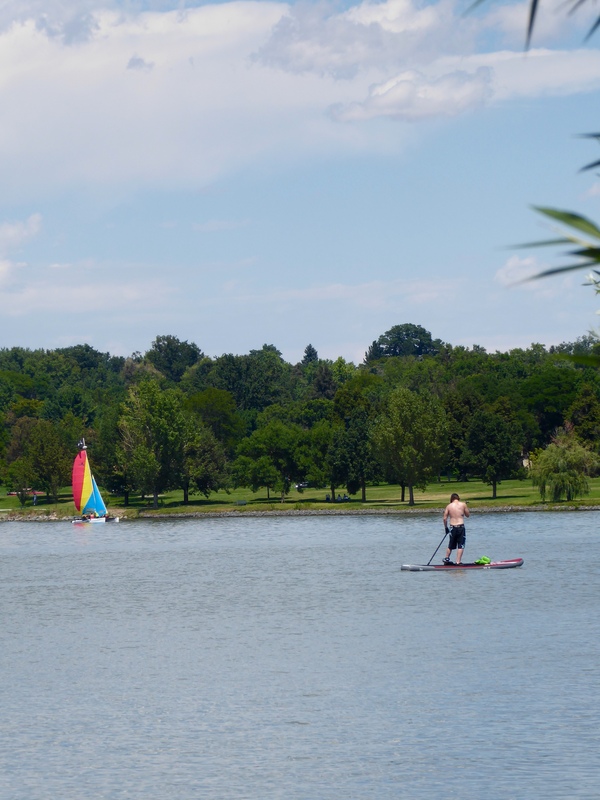 We like the stand up paddle boarding and the sailboat. 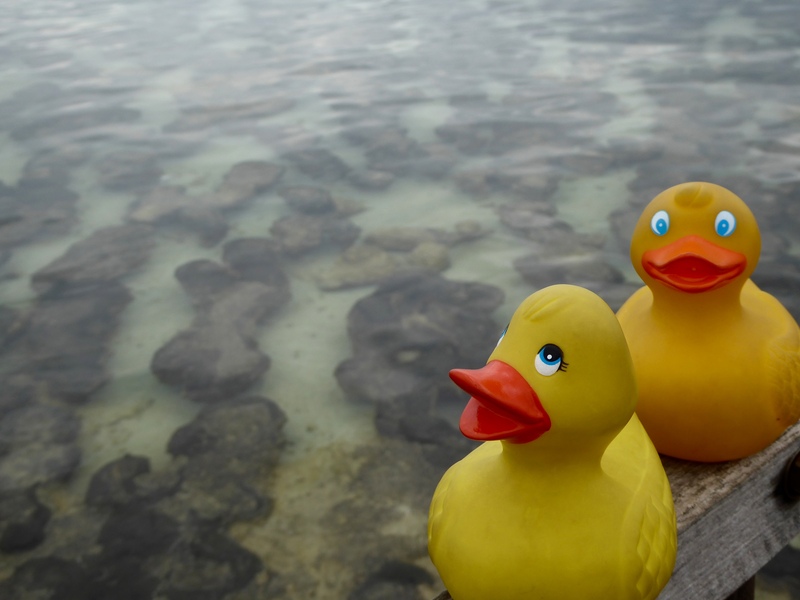 You would like to visit Sloan’s Lake. We do. 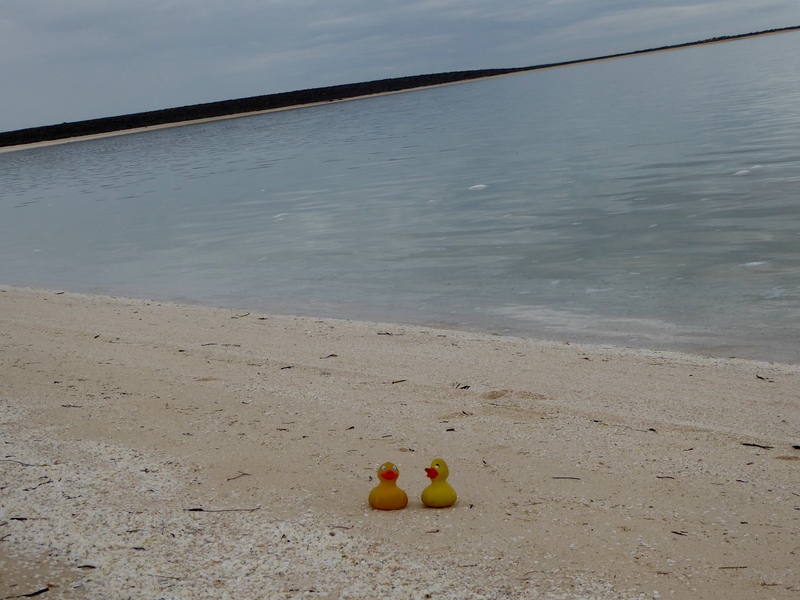 Zeb and Eider Duck, with the humans, visited Shell Beach. We have never seen anything like this before. 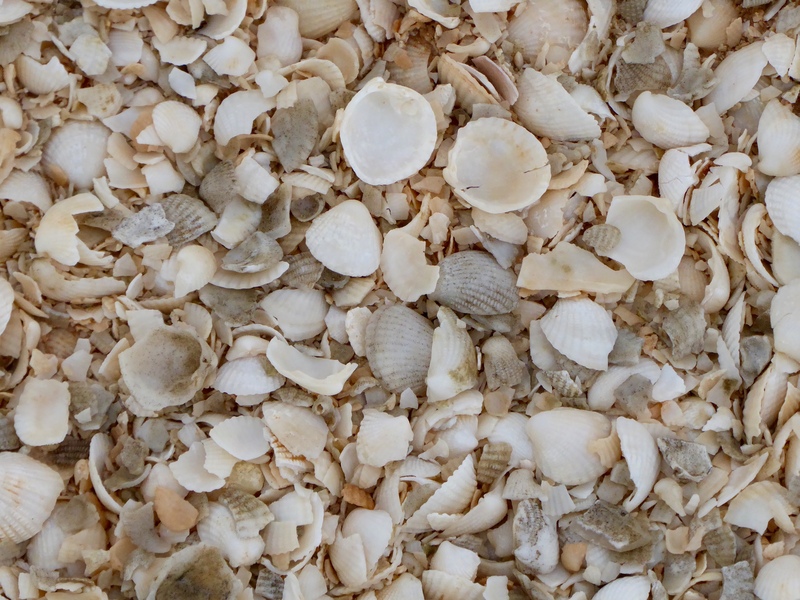 The beach is entirely made up of billions of tiny cockle shells layered up to ten meters deep. The beach stretches for 120 kilometers. 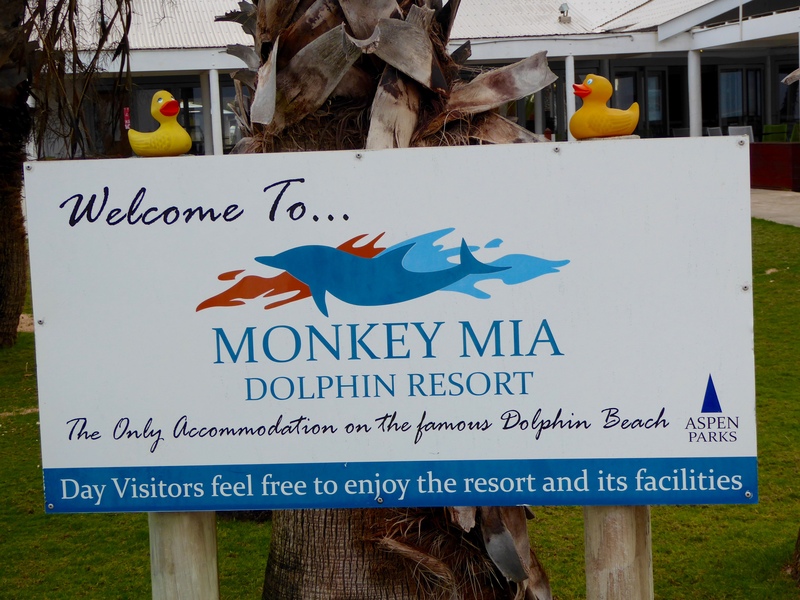 Upon entering Shell Beach we started reading the information signs. 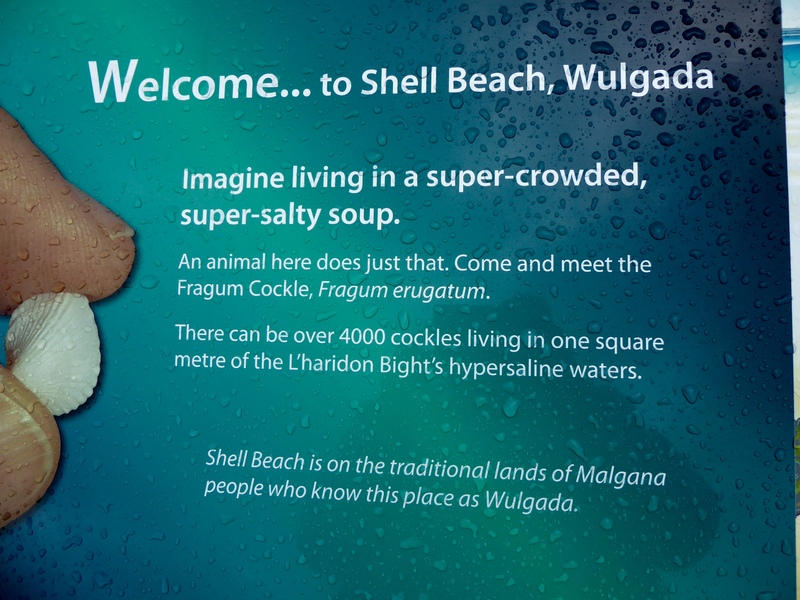 The first one started “imagine living in a super-crowded super-salty soup”. The Fragum Cockle does that. There can be over 4,000 cockles living in one square meter of the very salty water. 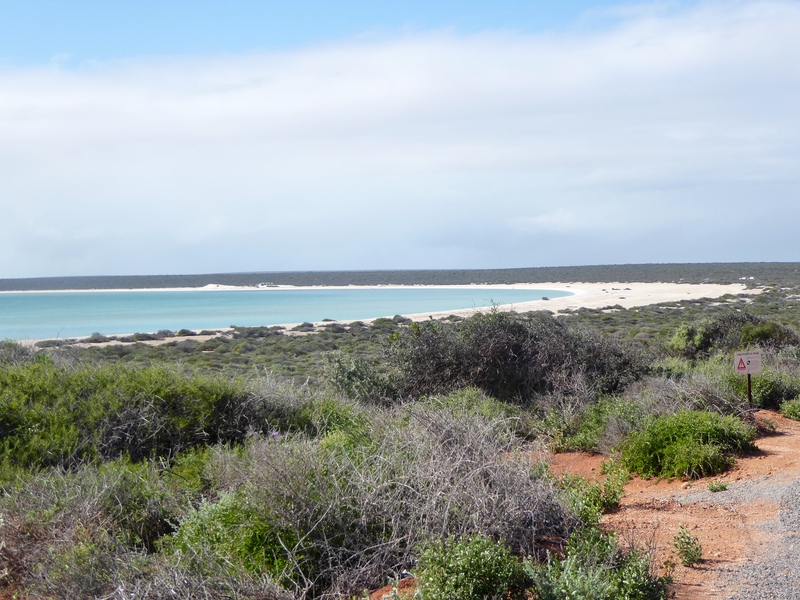 The water in Hamelin Pool, which includes Shell Beach, is about twice as salty as normal ocean water. 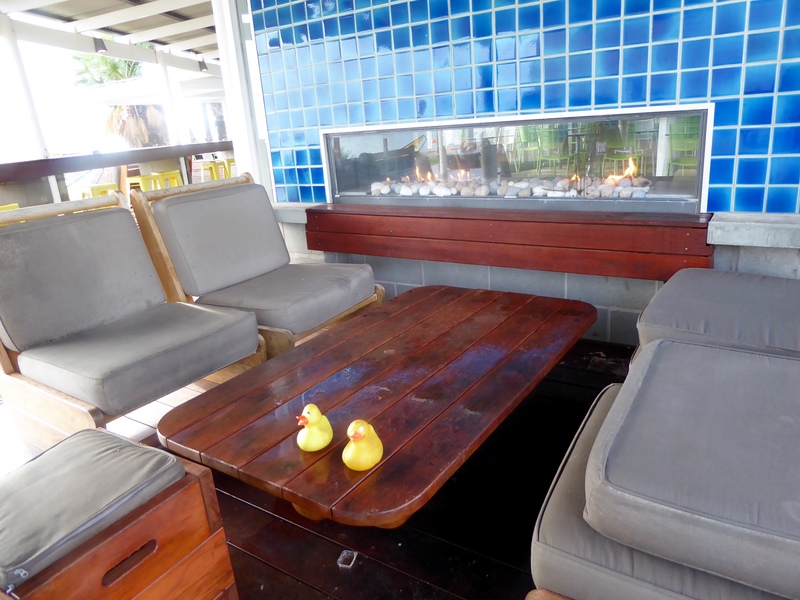 The water here arrives from the ocean and the evaporation rate is so high, that a higher salt content results. Closer to the water, there are more loose shells. You can see us sitting on the many shells. Further from the water, the Shell Beach has dips, looking like waves. 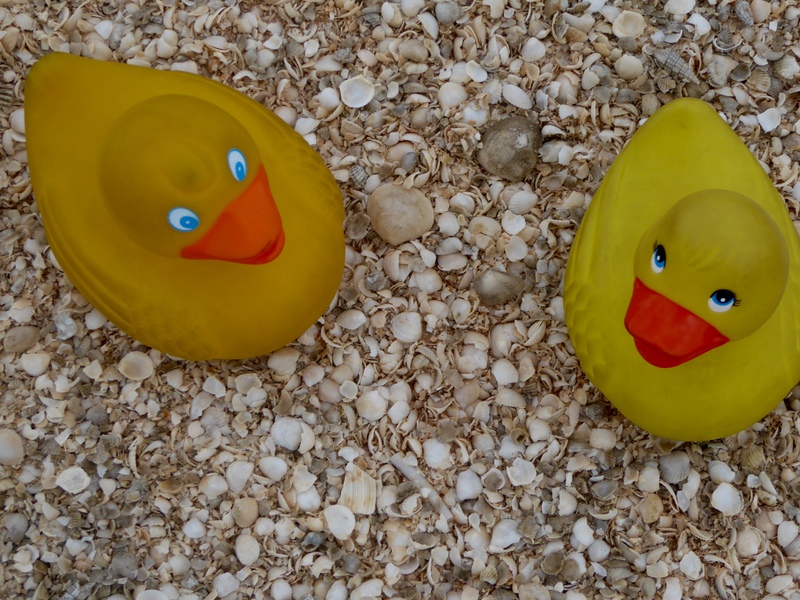 This beach is really made of shells. 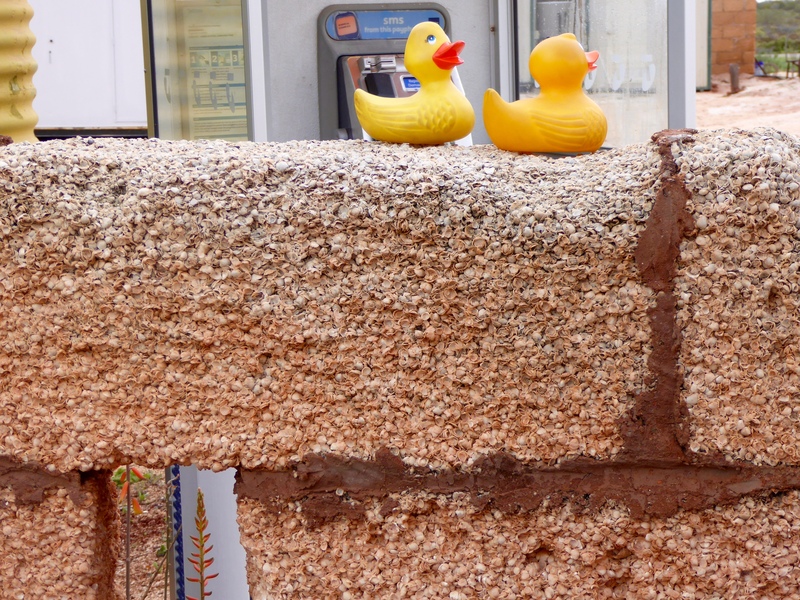 They can adhesive together and are very strong Many buildings are made entirely or partly with shell blocks. These are shell blocks. You can see the individual shells that make up the blocks. 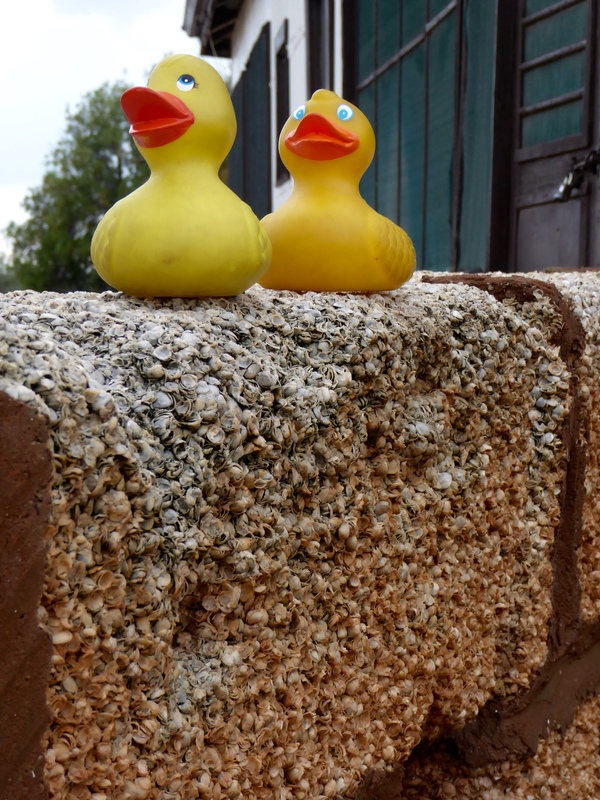 Shell blocks were the main building material for many of the homesteads. Shell block is a wonderful insular. Isn’t this a pretty beach? 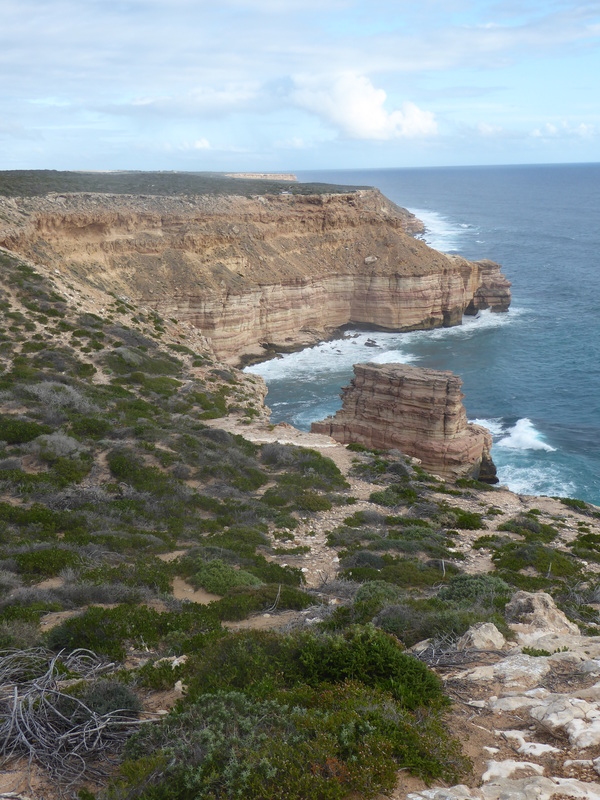 It is Shell Beach from a higher lookout point on the World Heritage Drive. 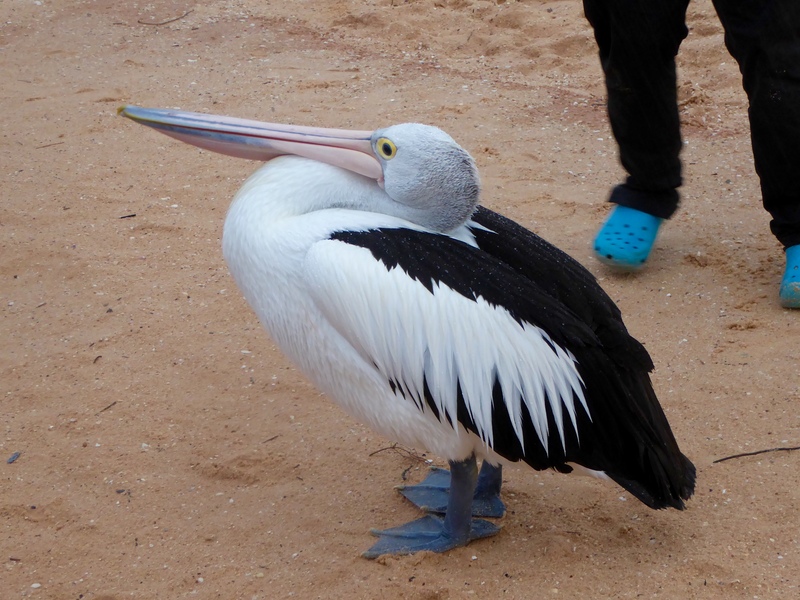 We liked Shell Beach, but for humans walking without shoes, the shells are rather sharp and cause some pain. 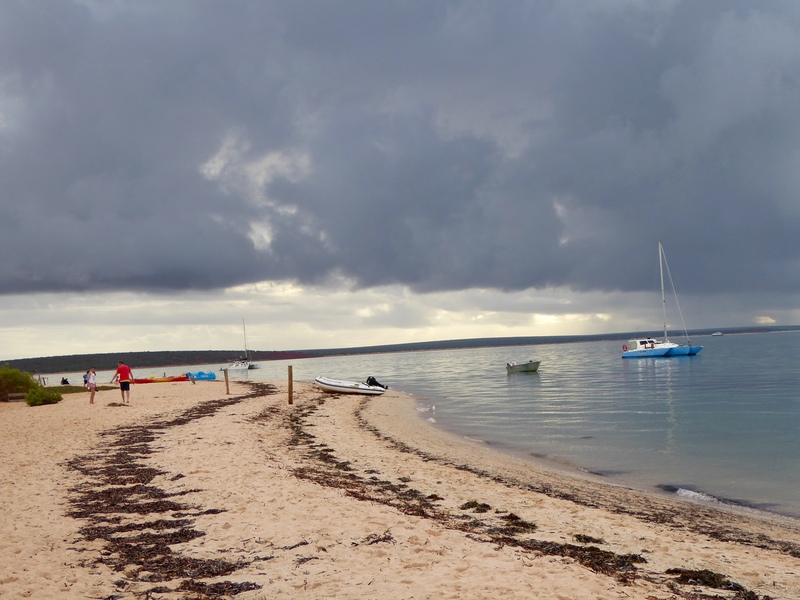 Shark Bay is a World Heritage Site on the western coast of Australia, and we are going to visit. 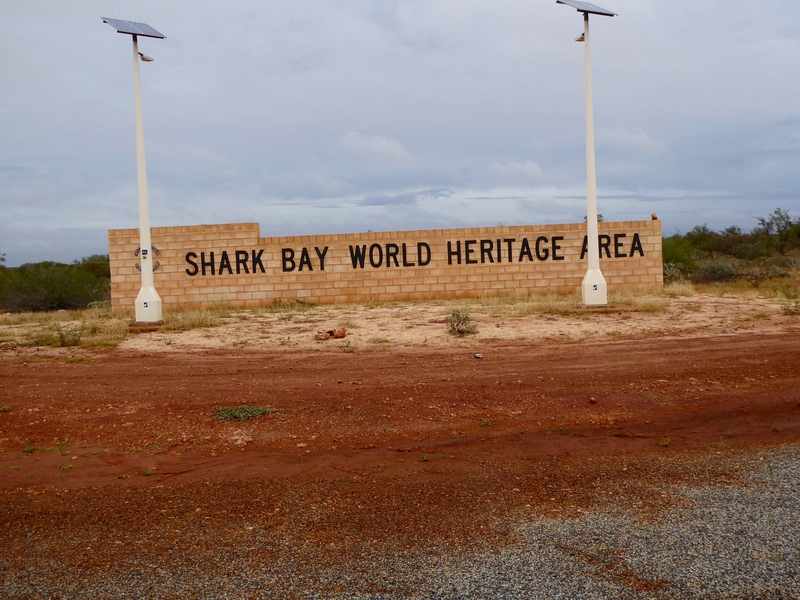 Shark Bay is an area, not just one place. 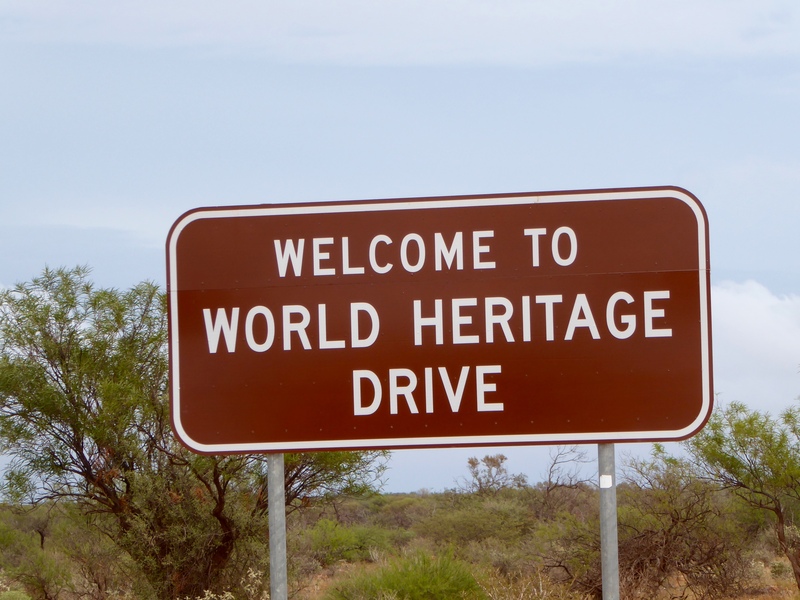 We are driving on the World Heritage Drive. 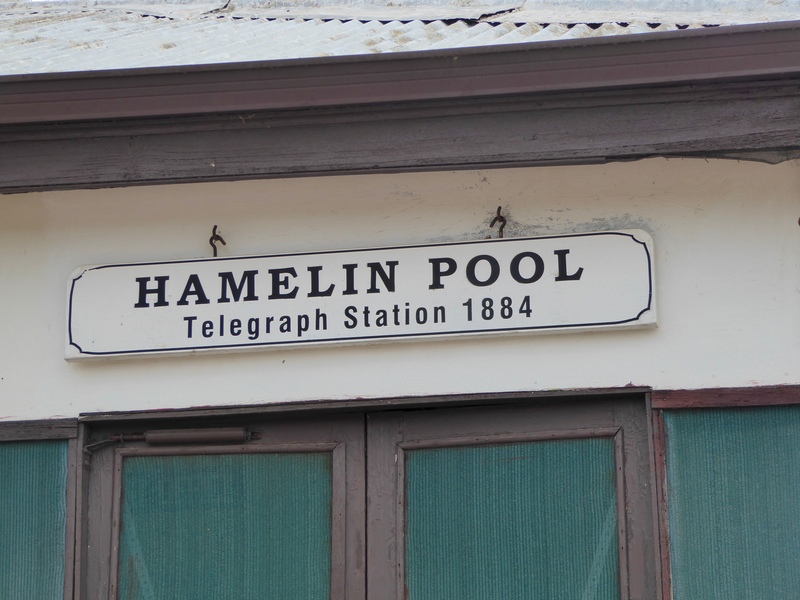 First stop is Hamelin Pool to see the only remaining Telegraph Repeater Station, established in 1884. 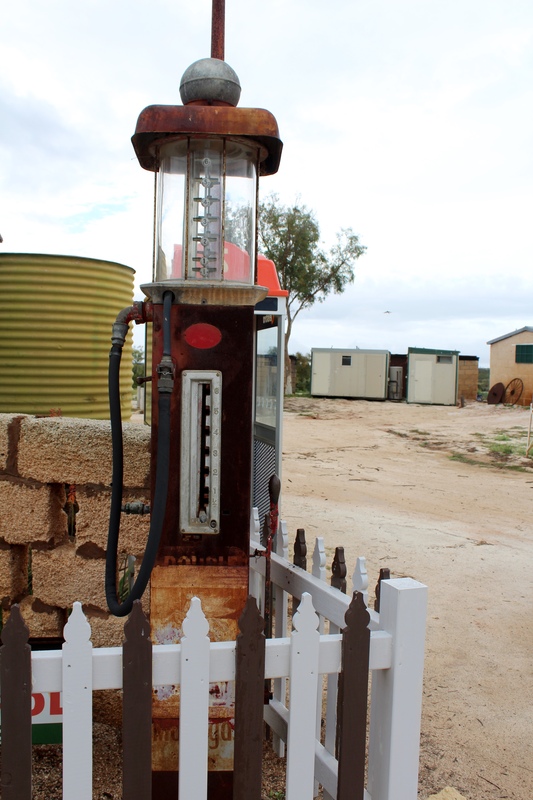 We like the gas or petrol pump here also. 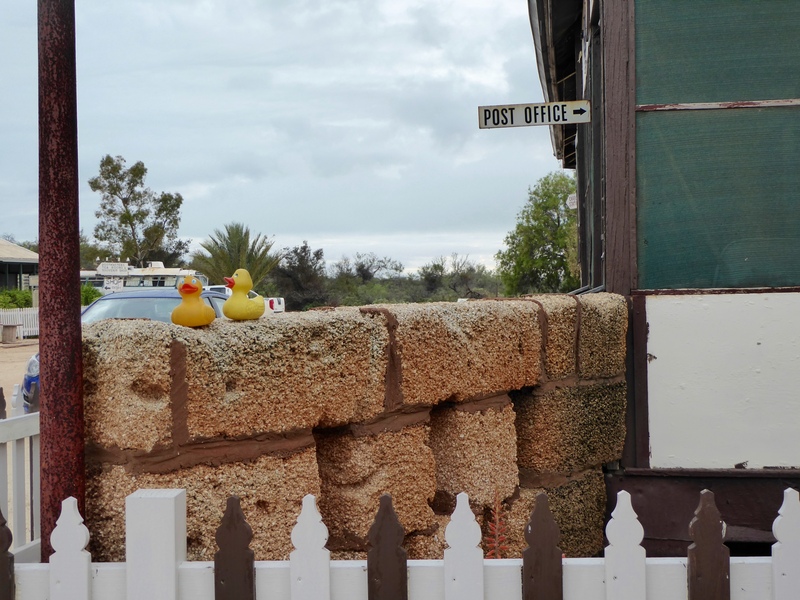 Inside the telegraph station, there was a sign explaining the evolution of communication: from dot dash to dot com. On 1964 the first Gemini space capsule was to be traced across Australia, but there was a temporary problem with the phone line. Mrs. Lillian O’Donohue using the Morse code link, spent 4 hours relaying important information through Hamelin Pool until the phone line was fixed. we read the explanations of stromatolite and also looked at them growing in the water. 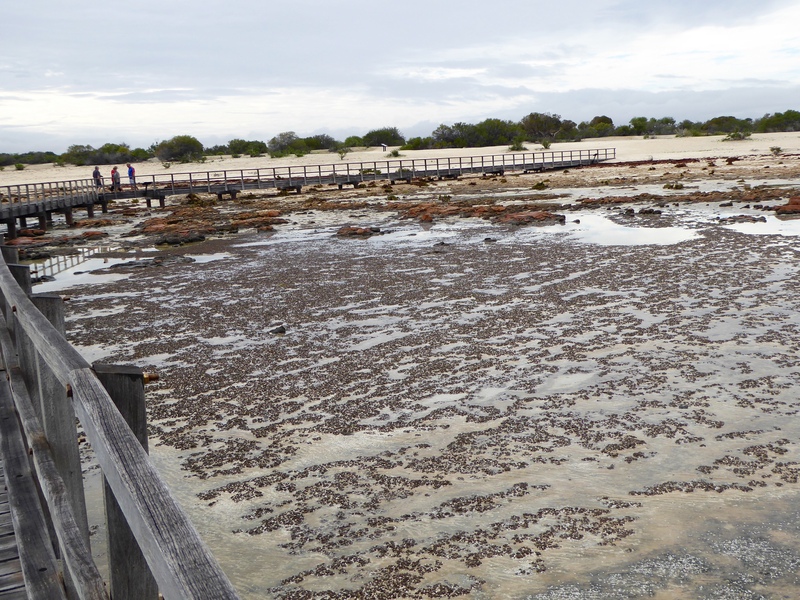 Hamelin Pool is one of a few places on earth where living marine stromatolites exist. 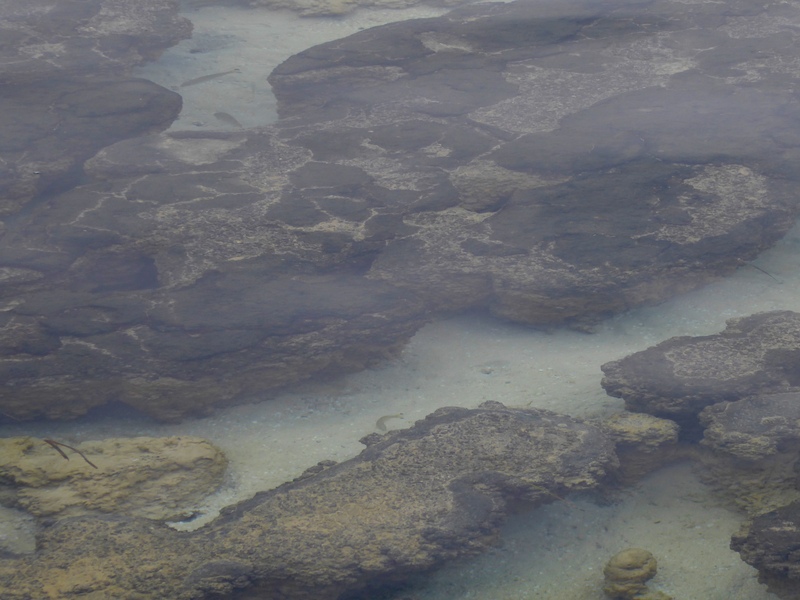 The rocky looking lumps in the water are the oldest and simplest forms of life on earth dating back 3.5 billion years. 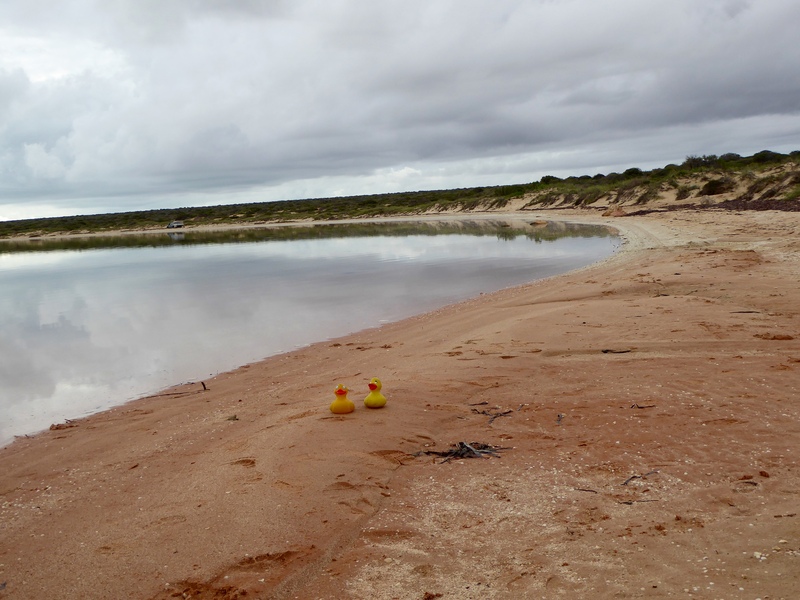 The water at Hamelin Pool is twice as saline as usual sea water, due to sea grass banks situated across the bay’s entrance and rapid evaporation from the shallow water. 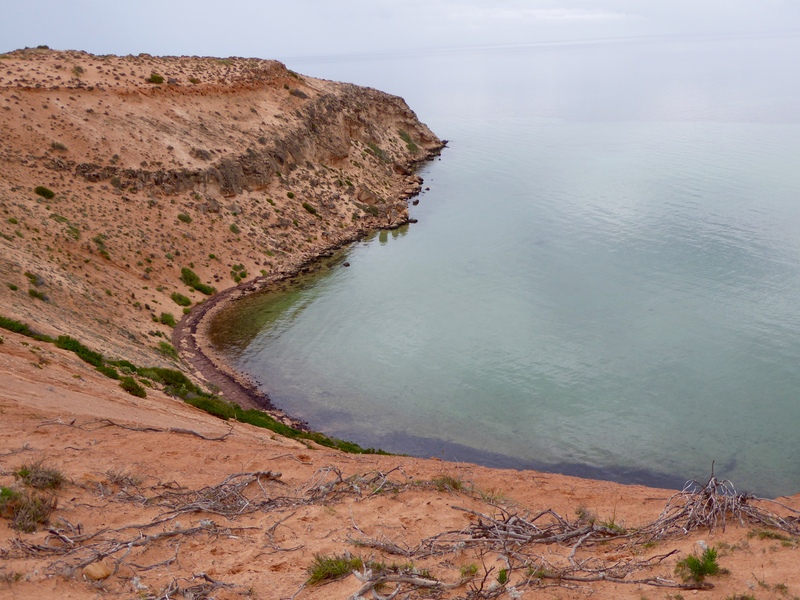 At Eagle Bluff we looked into the shallow water of Shark Bay Marine Park and saw Cowtailed stingray. 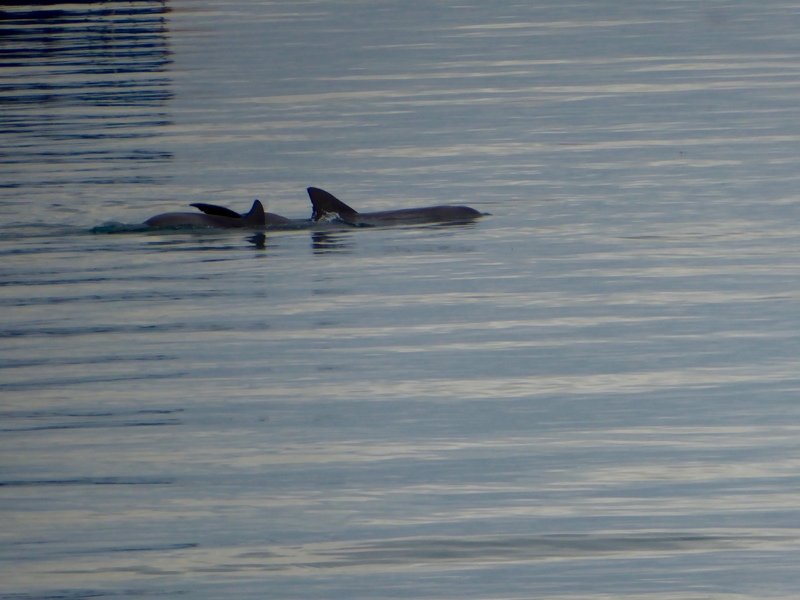 They were visible and we saw them move but photos were not successful. 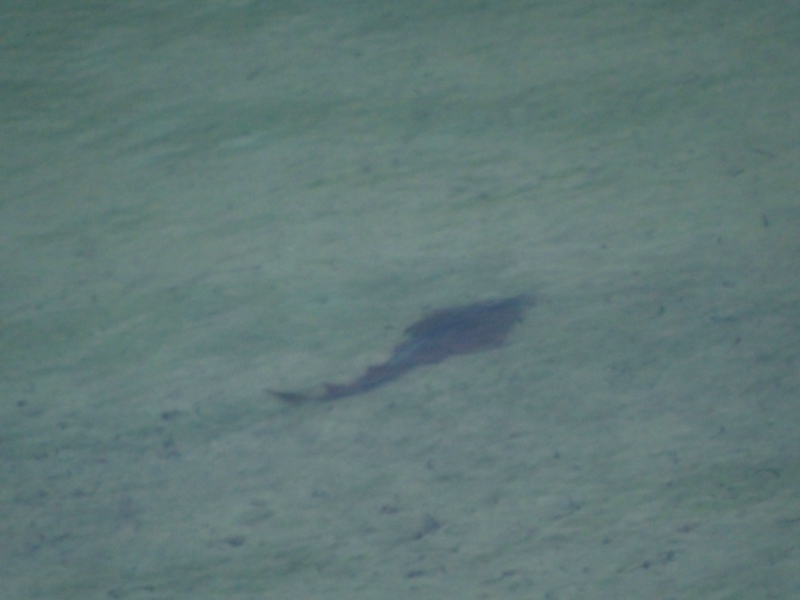 Walking along the boardwalk on the edge of the cliff, we saw Nervous Shark. 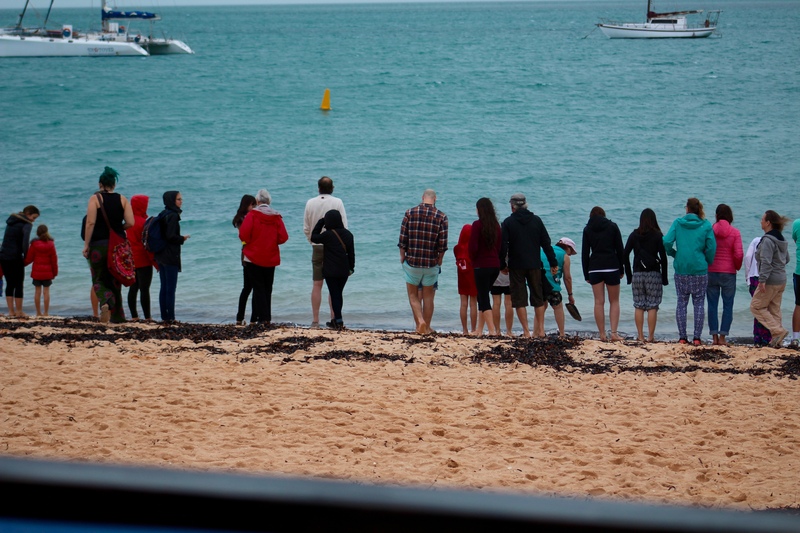 This photo shows one of the shark. 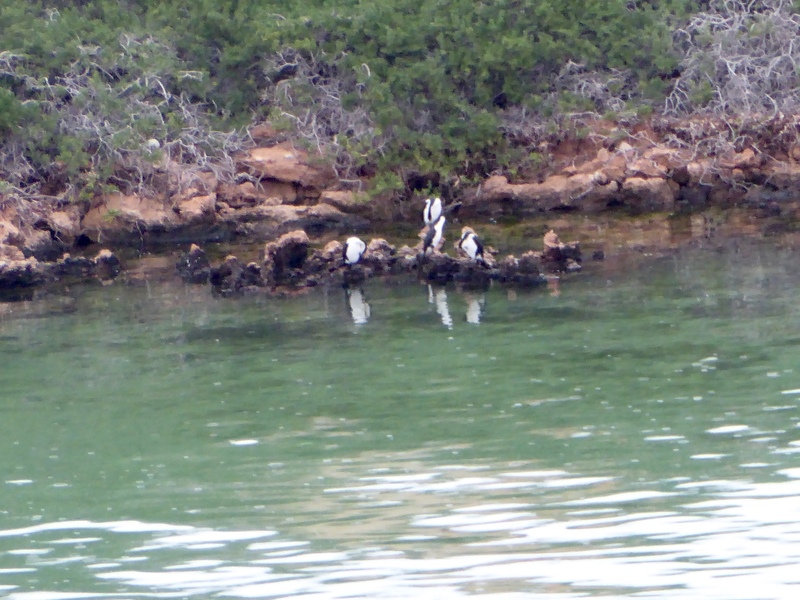 We saw more than 3 of them, but again, photos were not great. Seeing the sharks and stingray in the ocean was wonderful! Part of the coastline was rocky and really beautiful. 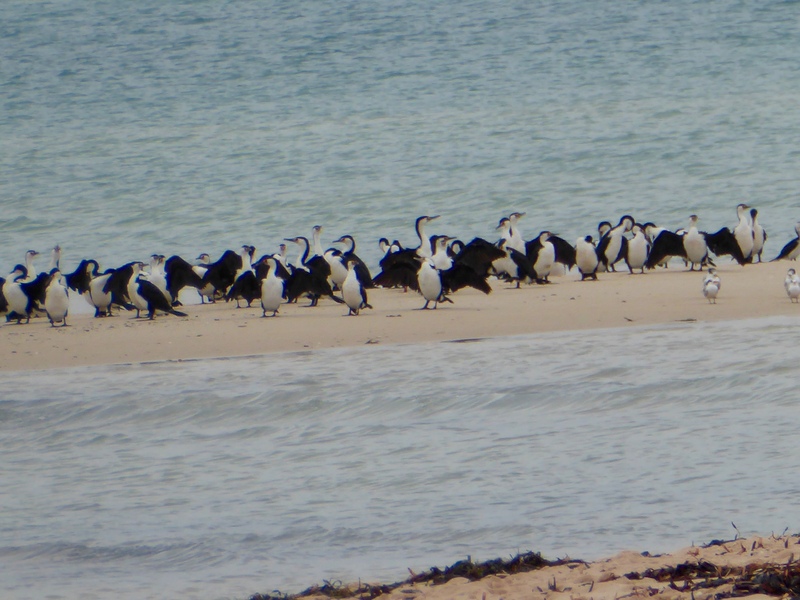 These islands are now important bird breeding colonies. 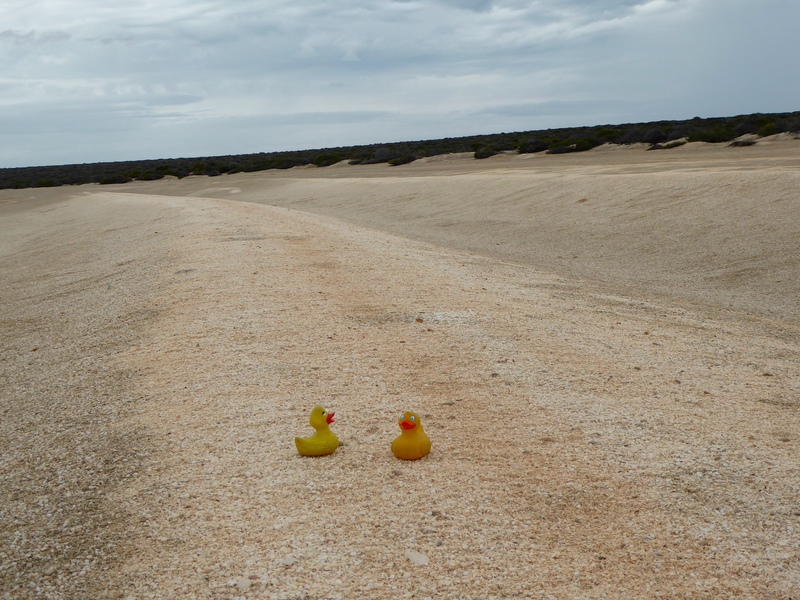 Further along the World Heritage Drive, we stopped at Little Lagoon. 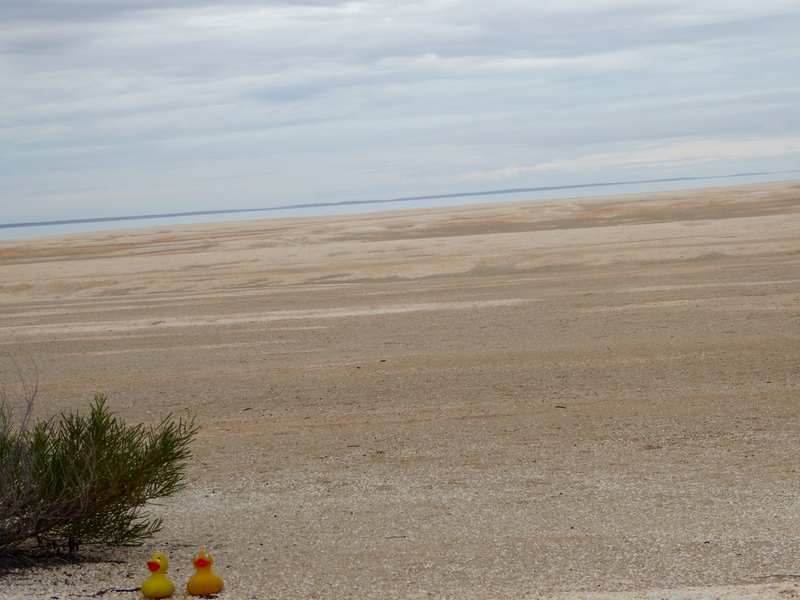 The lagoon is almost a perfect circle in shape. This was once a land-locked birrida (gypsum pan) that was inundated by the sea several thousand years ago. 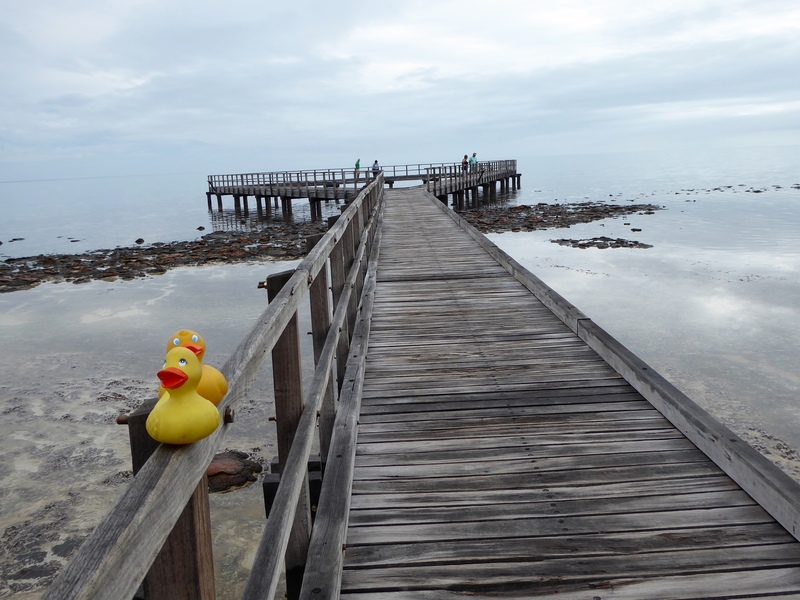 Linked to the sea by a small tidal channel, Little Lagoon is a natural nursery for several species of fish. Also when we were here, a man was having a problem getting his dog, Smiley, in the truck to go home. Smiley wanted to play and swim. We hope Smiley and his human got home without much trouble. 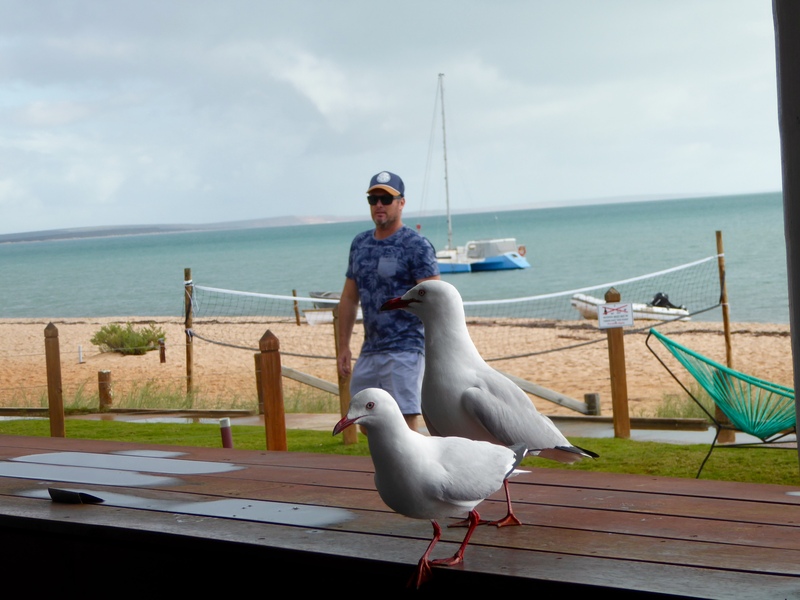 Next time we will tell you about a special beach at Shark Bay World Heritage Site. Yesterday, Wednesday, according to our calendar, was the first day of autumn. Zeb and Soapy discovered autumn colors in the mountains. 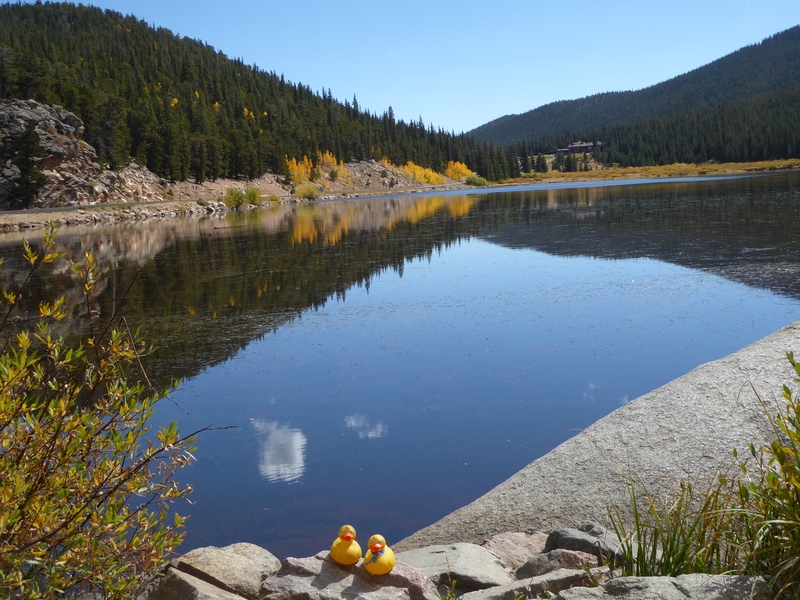 We went to Echo Lake, near Idaho Springs, Colorado. 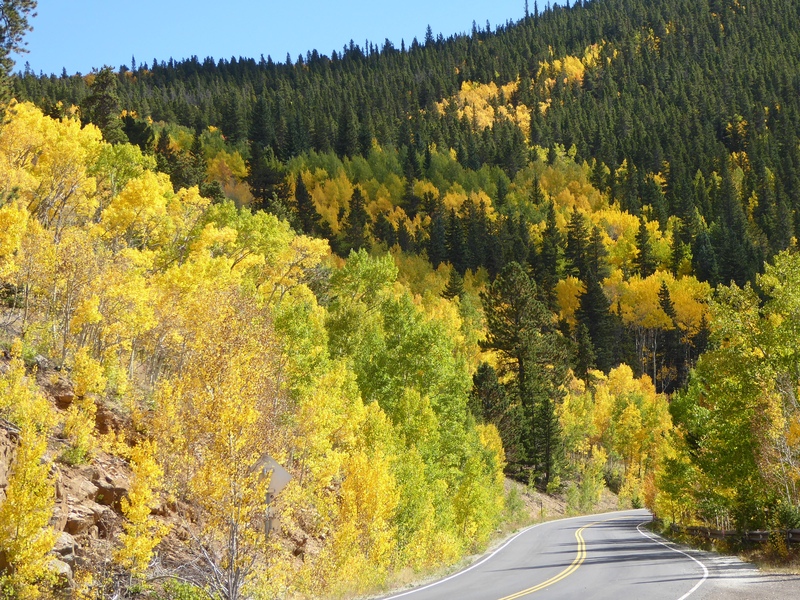 Driving down the road we admired the fall colors and the brilliant blue sky. 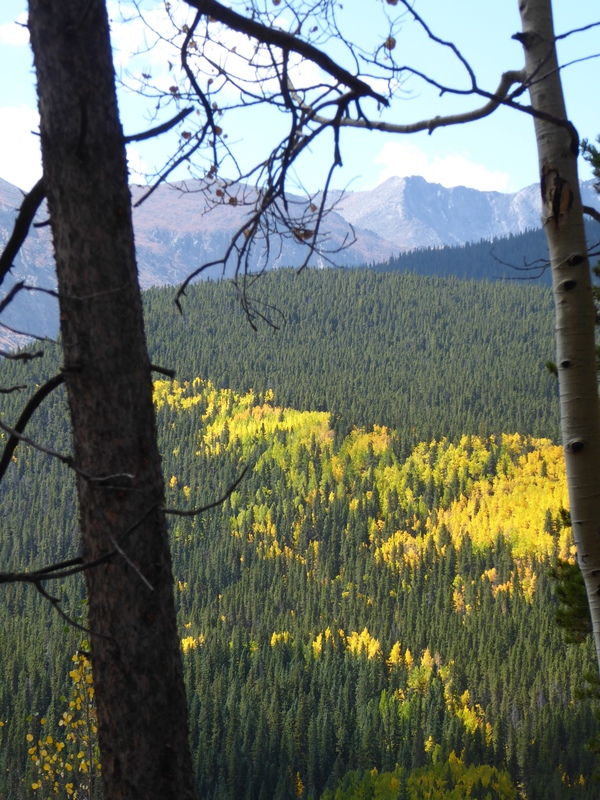 Of course, we had to look back and see the colors from the other direction. Beautiful, isn’t it? 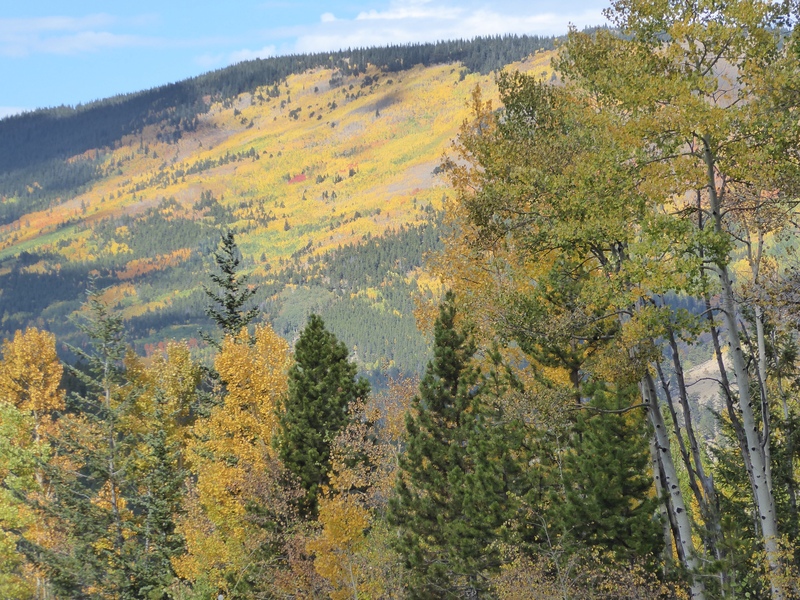 Looking through the trees, we saw the golden aspen leaves and the majestic Rocky Mountains. Here we are at Echo Lake. 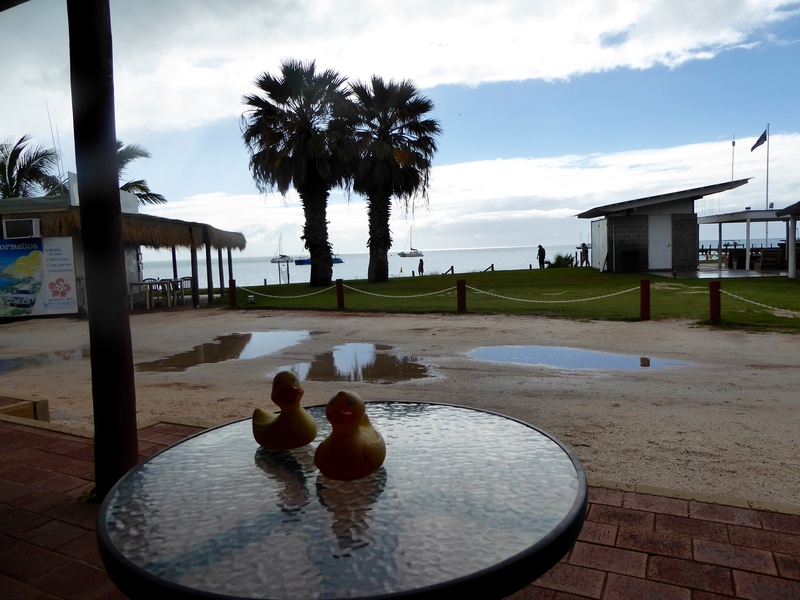 We loved the reflections on the water. The gold aspens and the fluffy white clouds reflected on the lake made us smile. It also made us hungry. 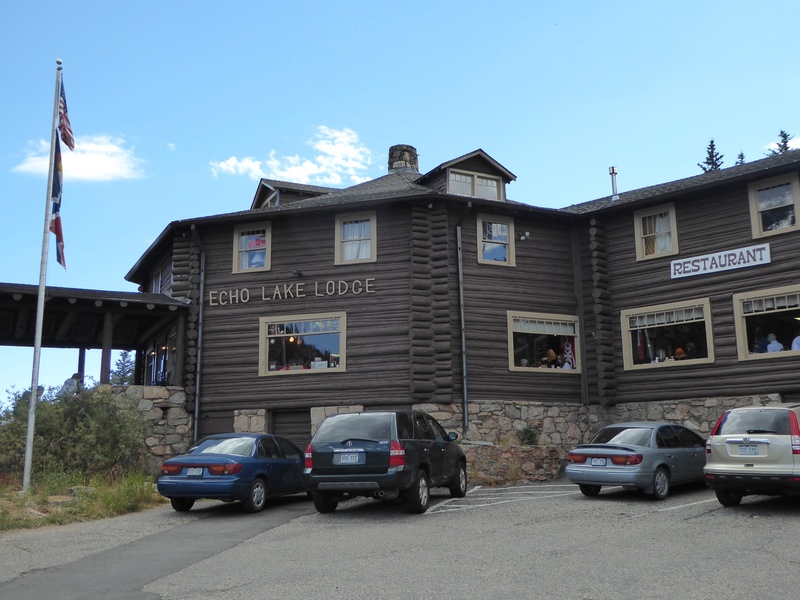 The restaurant in the Echo Lake Lodge provided us with a very tasty lunch. We are so happy we live in Colorado. 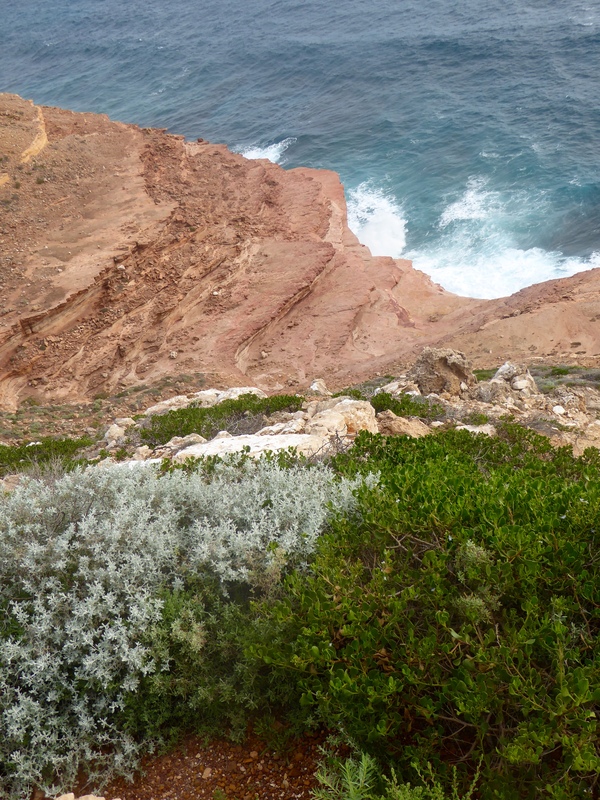 Kalbarri National Park, in Western Australia, has coastal lookouts and look out points over the gulches of Murchison River. 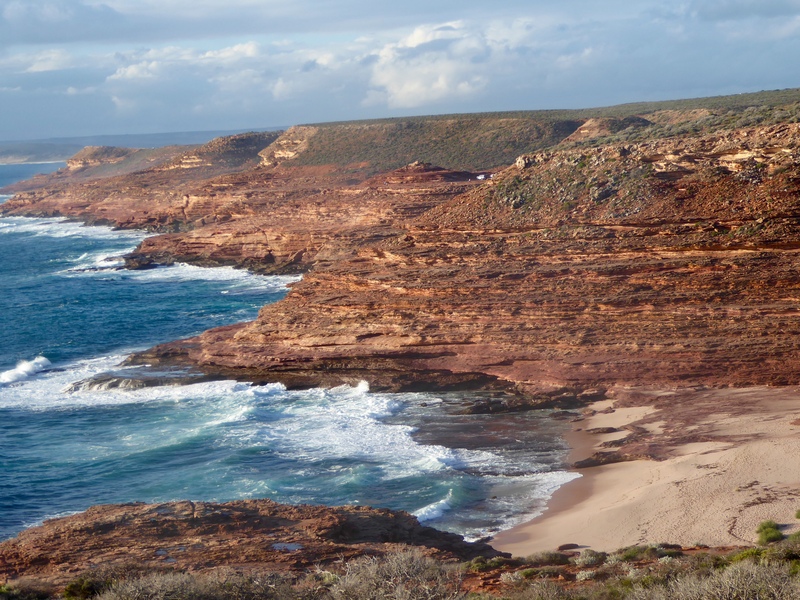 After leaving the Principality of Hutt River, we drove to the Indian Ocean coast toward the town of Kalbarri. 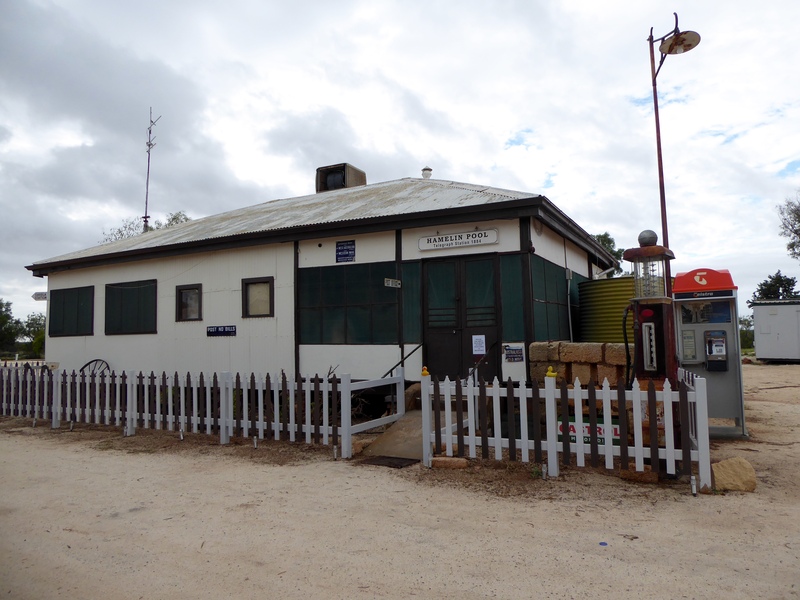 Our first stop in the national park was Grandstand. 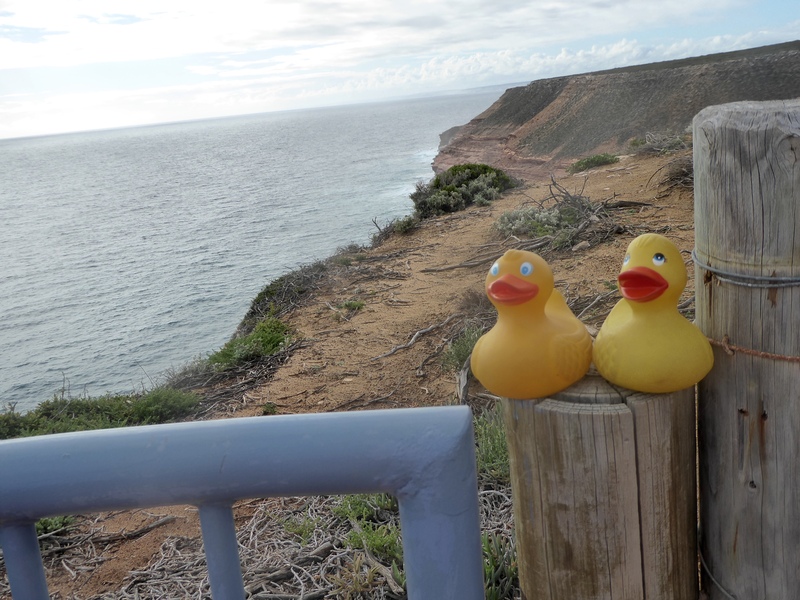 We, Zeb and Eider, were very careful because the wind was pretty strong. 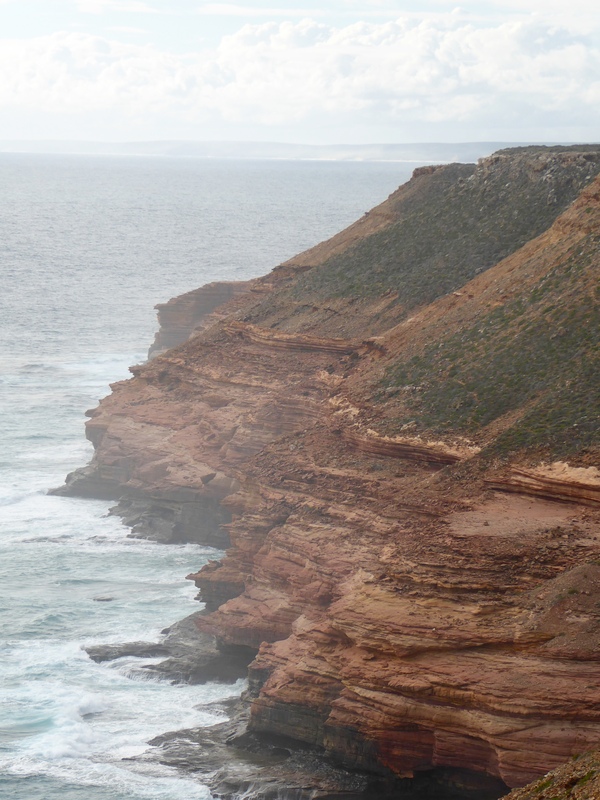 We loved looking at these cliffs of the Indian Ocean. 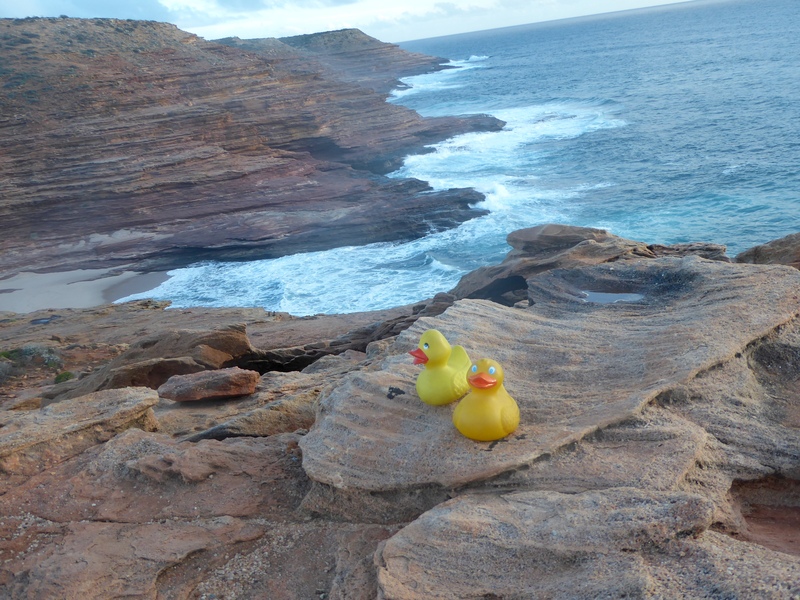 Our next stop was at Island Rock. It really is an island of rock. 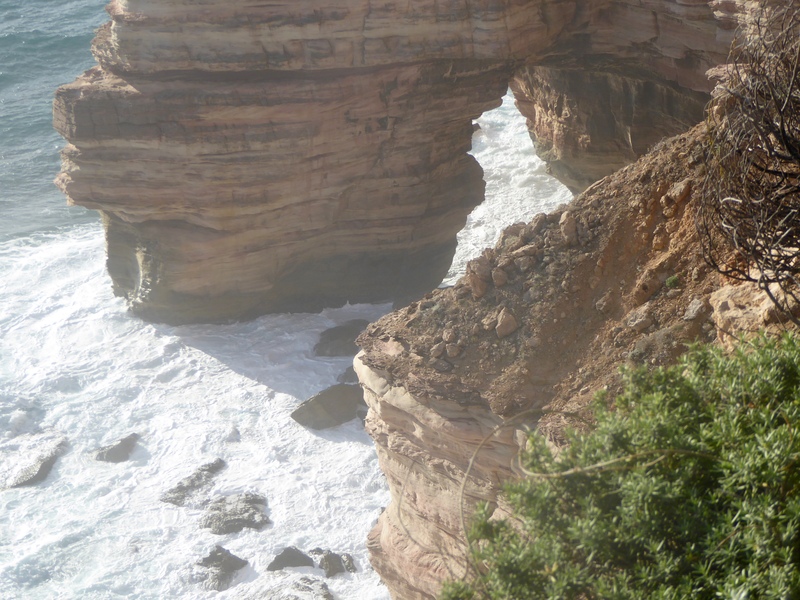 Natural Bridge, a little further along the coast, was nice. This bridge was formed by the force of the water, cutting through the rock. Here at Eagle’s Gulch, we admired this beach. This would be a great place for a picnic. 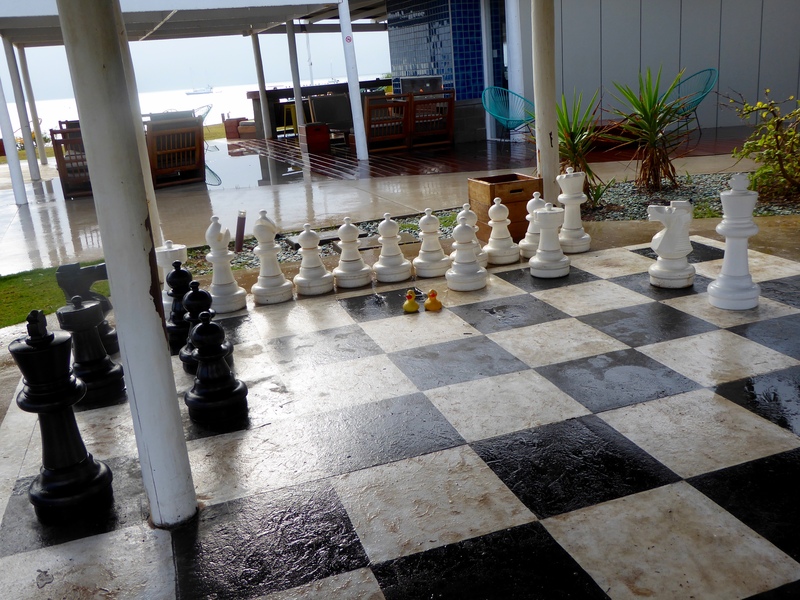 More beautiful views of the Indian Ocean from Pot Alley. 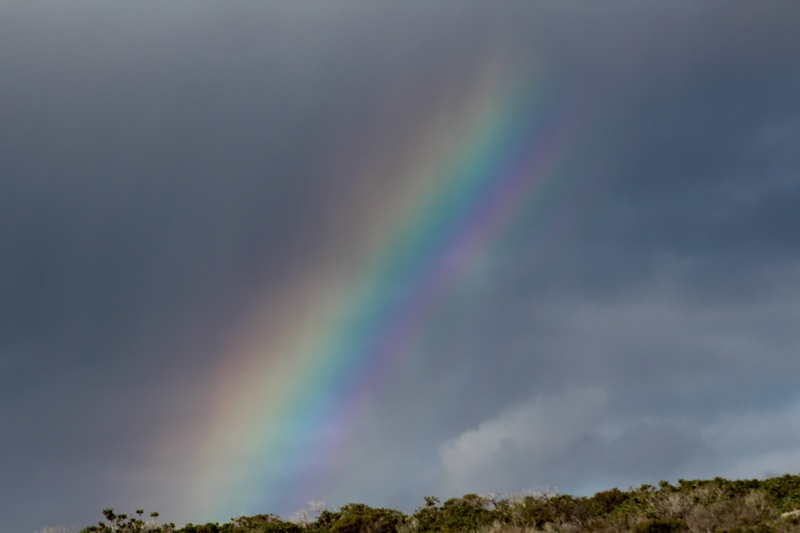 As the weather changed, we saw this rainbow. 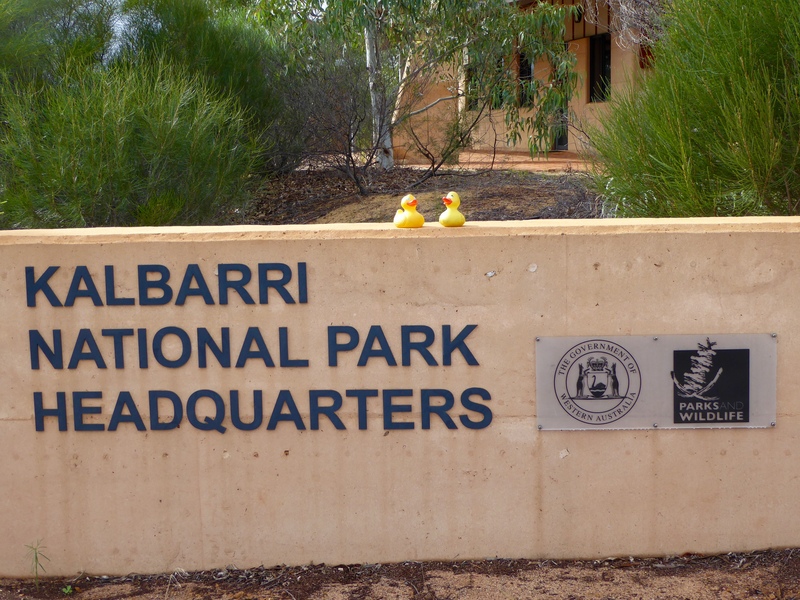 Next morning we drove a little inland to the entrance of Kalbarri National Park. 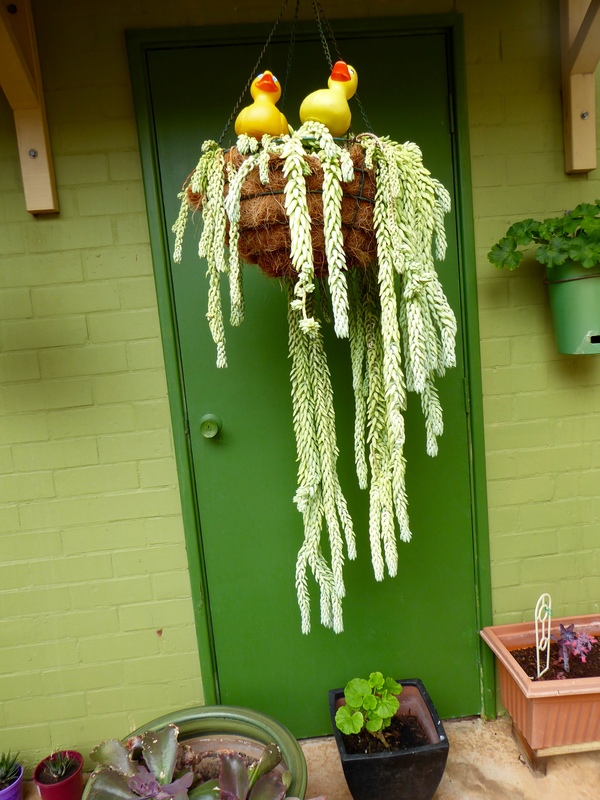 We were fascinated by this plant at the Park Headquarters Building. 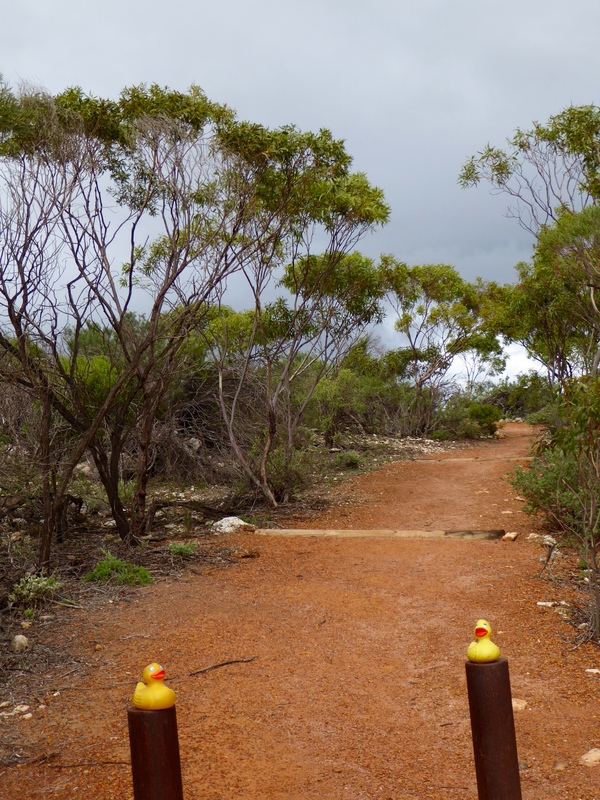 The Murchison River flows through the park, so we had our choice of hiking trails and beautiful views of the gorge. This was our first hiking trail. We enjoyed this view from the trail. 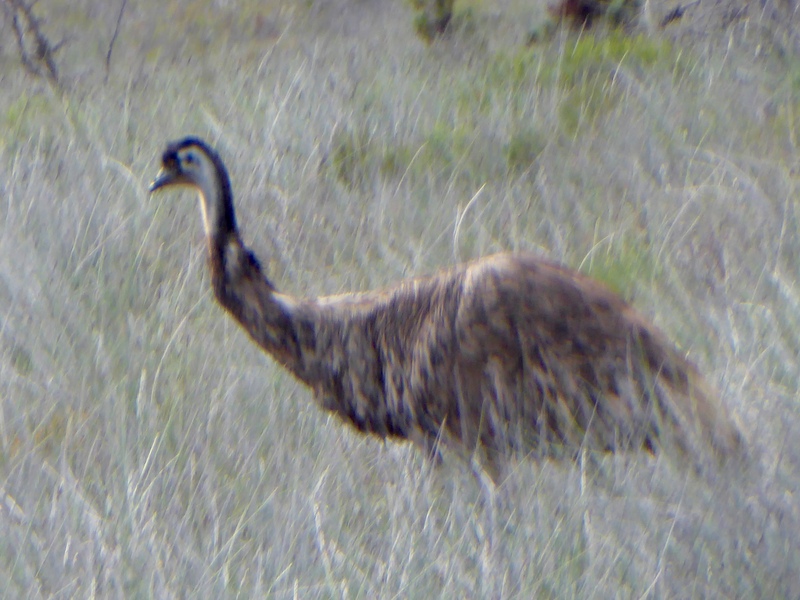 After our hike, we drove a little further and saw this emu. 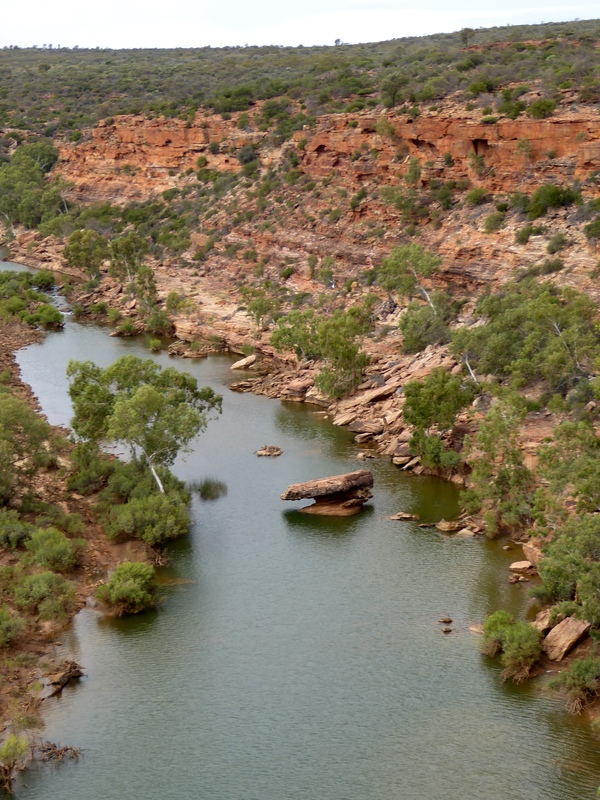 This was a pretty view of the Murchison River from Hawks Head Walk. 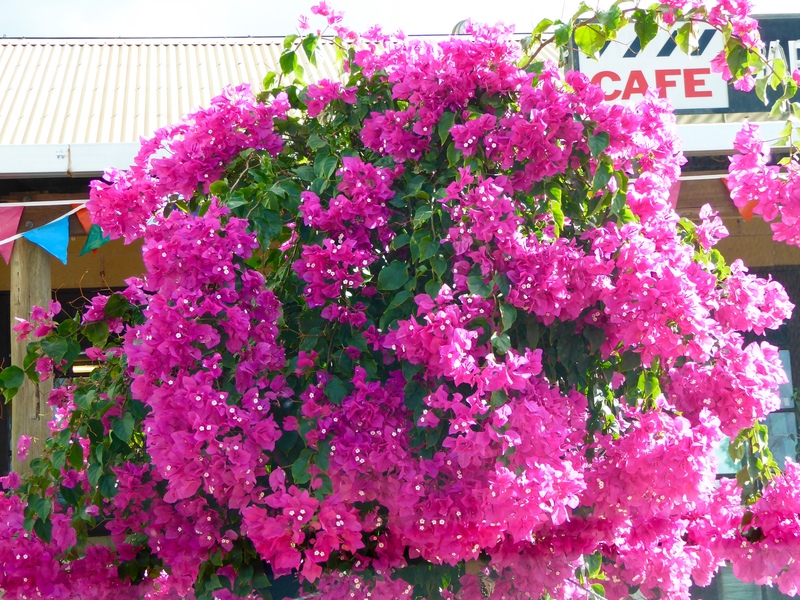 Since Western Australia is known for wildflowers, so we wanted you to see these flowers near the building. 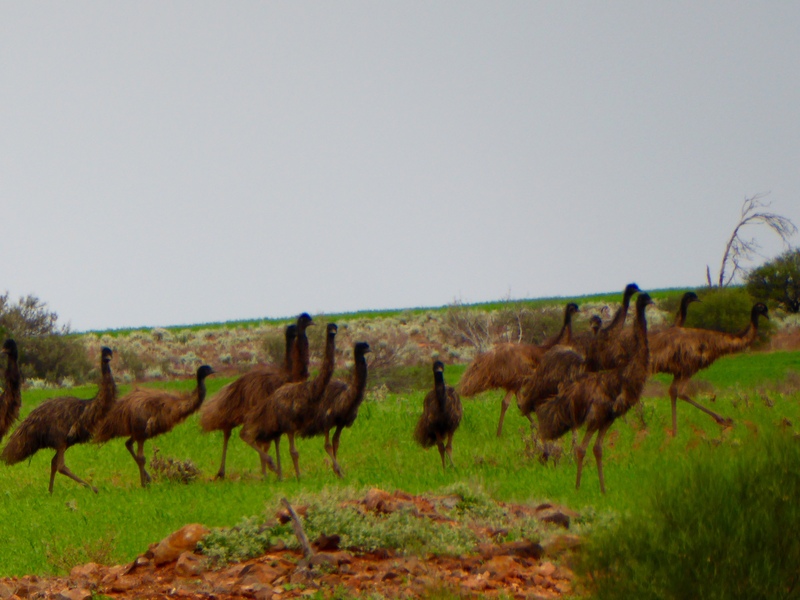 As we were leaving the park, we enjoyed watching this flock of emu. Are they sad we are leaving the park? 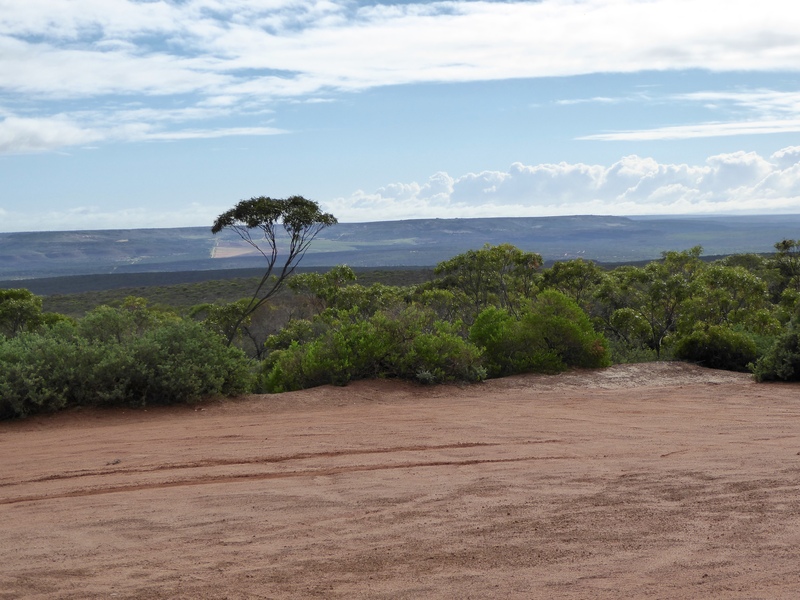 We are really enjoying our drive in Western Australia. You would enjoy time here also. 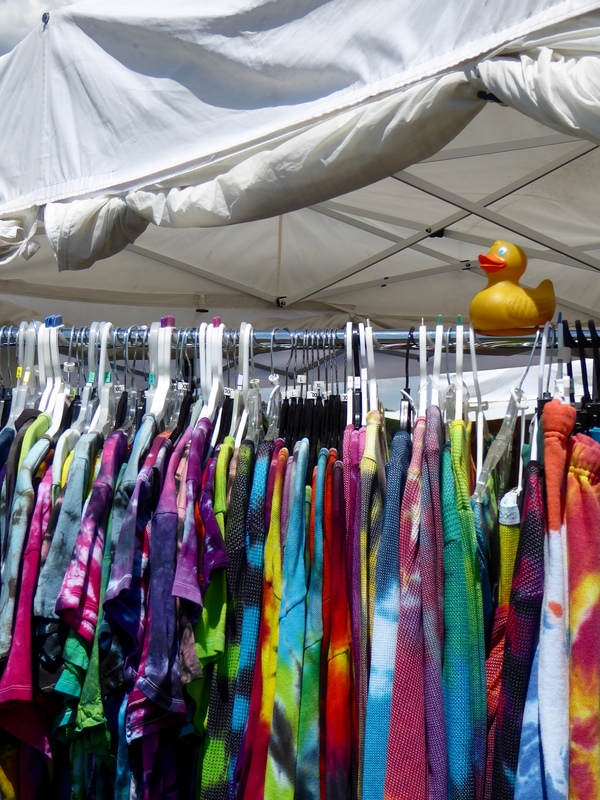 I, Zeb the Duck, went to a festival. 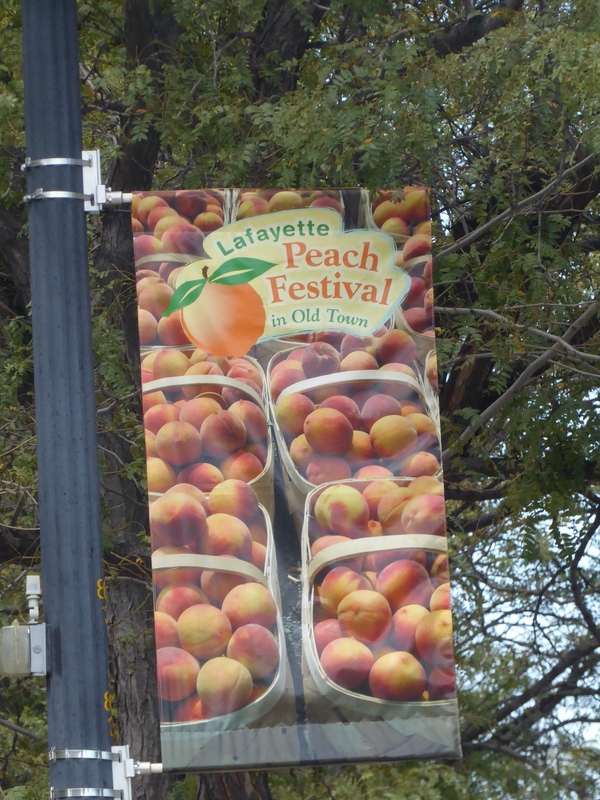 This was the 16th Annual Peach Festival in Lafayette, Colorado. 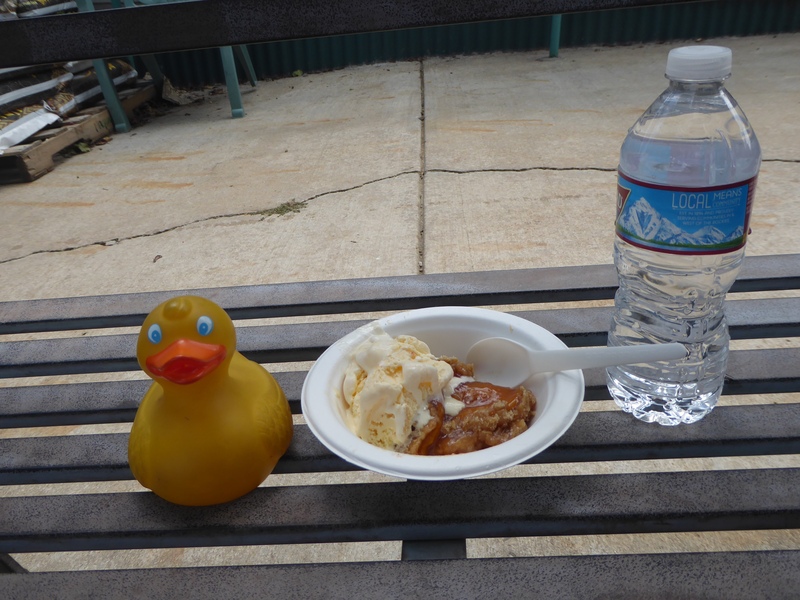 There were so many peach treats to taste, but we decided on peach cobbler with vanilla ice cream. while we ate our cobbler. There were fun activities for young humans. 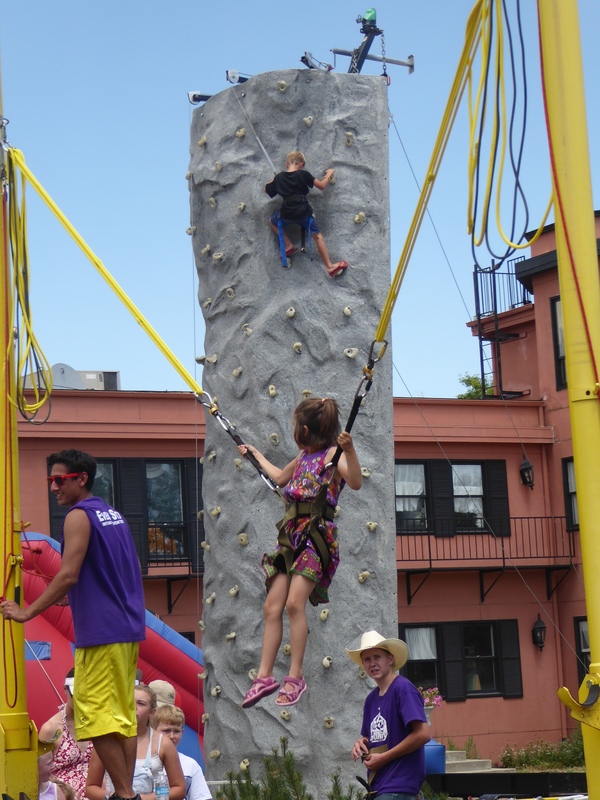 The girl has a harness that allows her to jump like she was on a trampoline and the boy is rock climbing. This soap is hand made and smells wonderful. 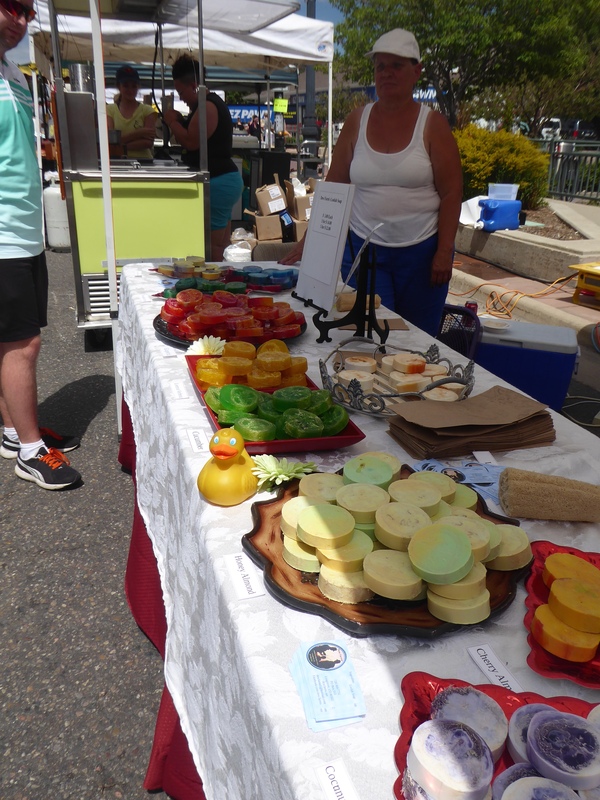 It is Loofah Soap from Dew Farms. 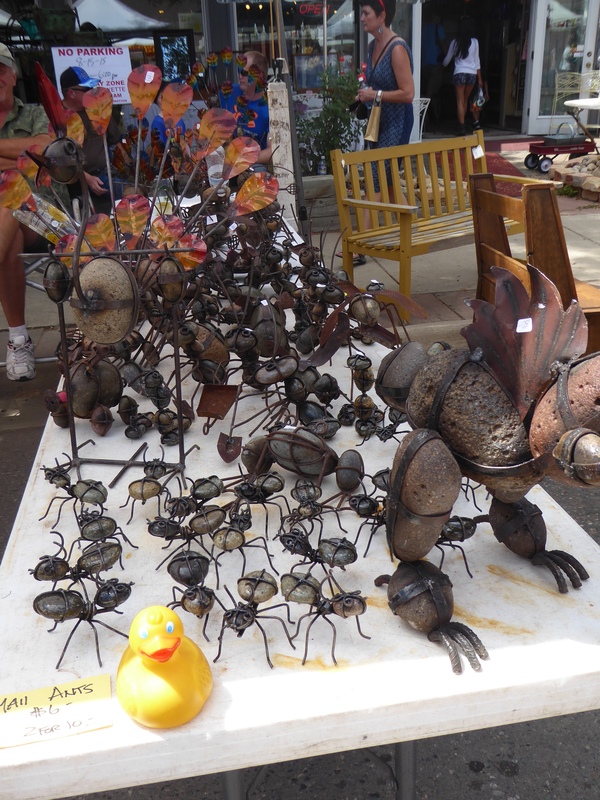 For more information visit http://www.dewfarms.net Look at these metal ants. Some are giants. 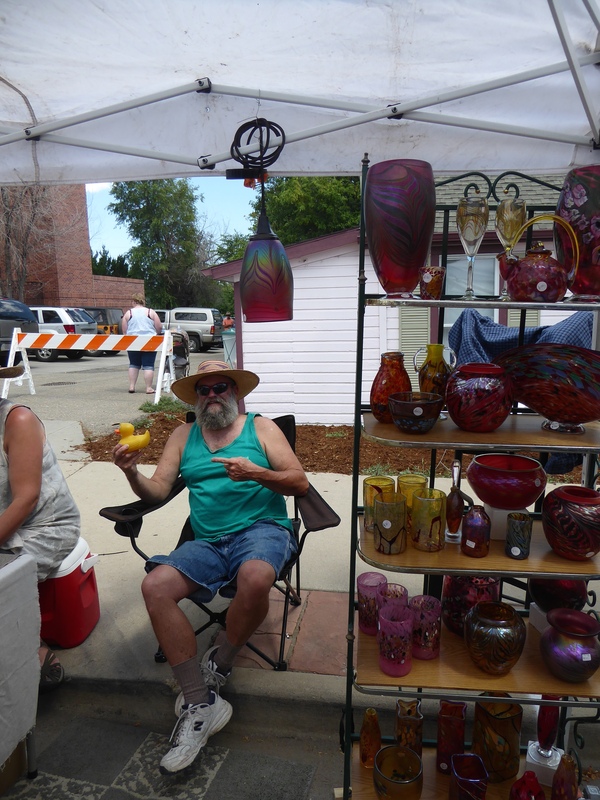 This man has beautiful glass for sale. This is Sheri and Jon from Hot Glass Ranch in Lucern Valley, California. 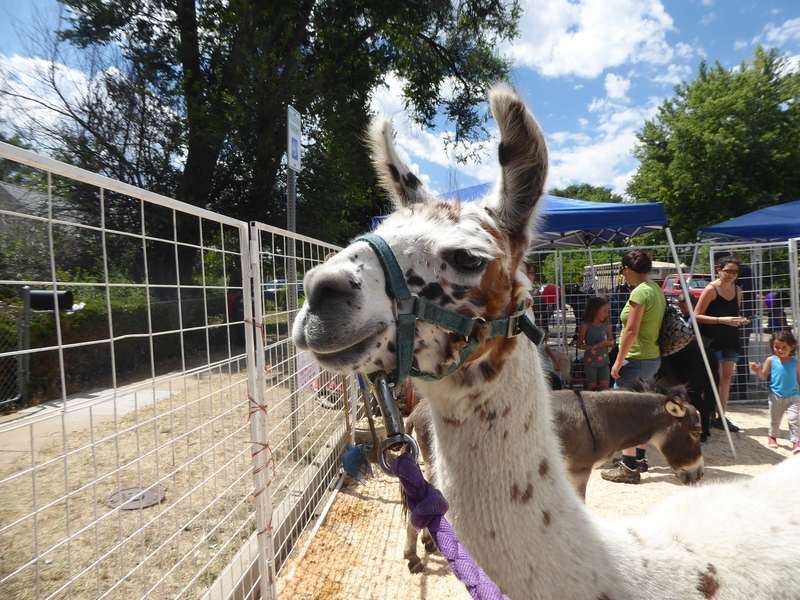 Of course, every festival needs a llama or alpaca. Isn’t he great? 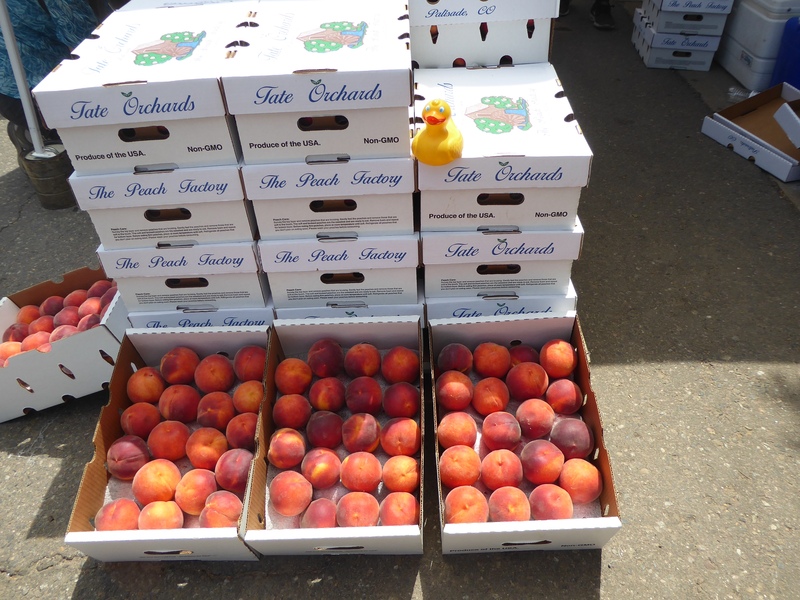 Since this is a Peach Festival, we saw many boxes of peaches. Yum! These hanging solar lights are really nice. Hey mom, they would look great in our back yard. 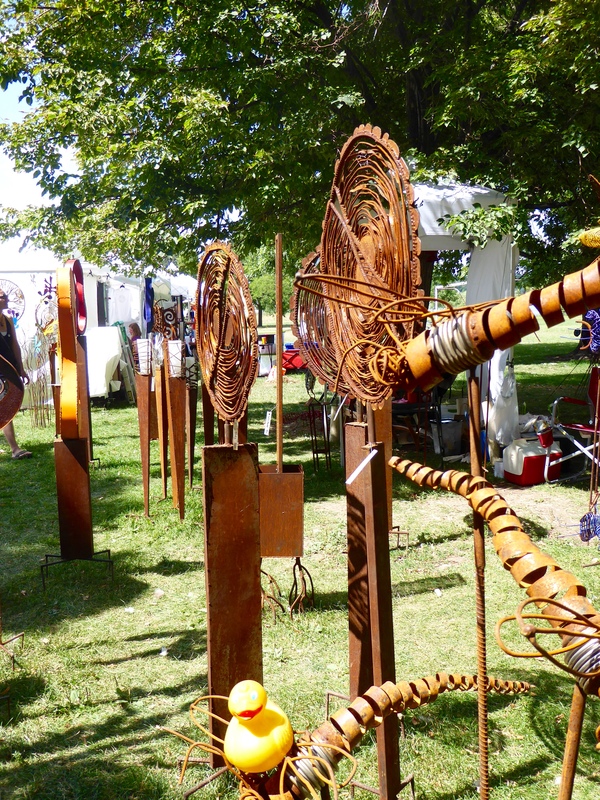 The lawn and garden stakes are very attractive also. 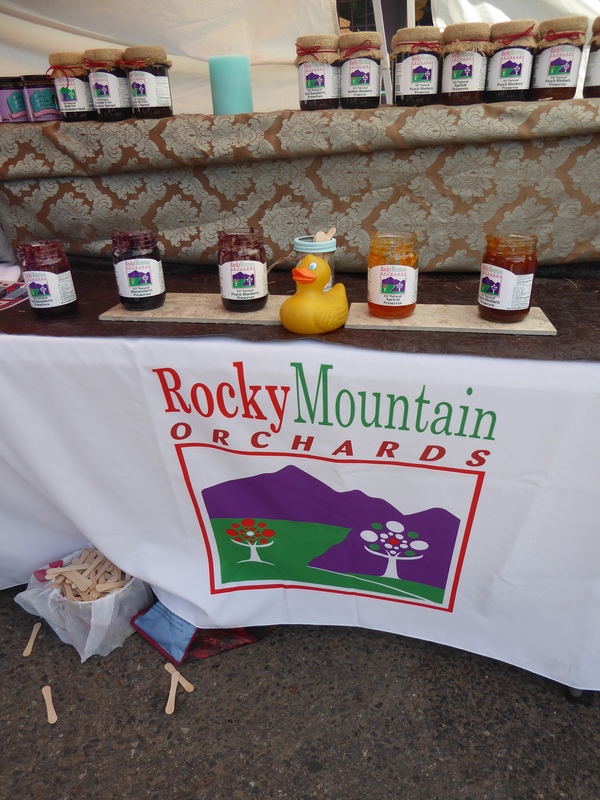 The very tasty fruit jams and spreads from Rocky Mountain Colorado were attractive and very flavorful. 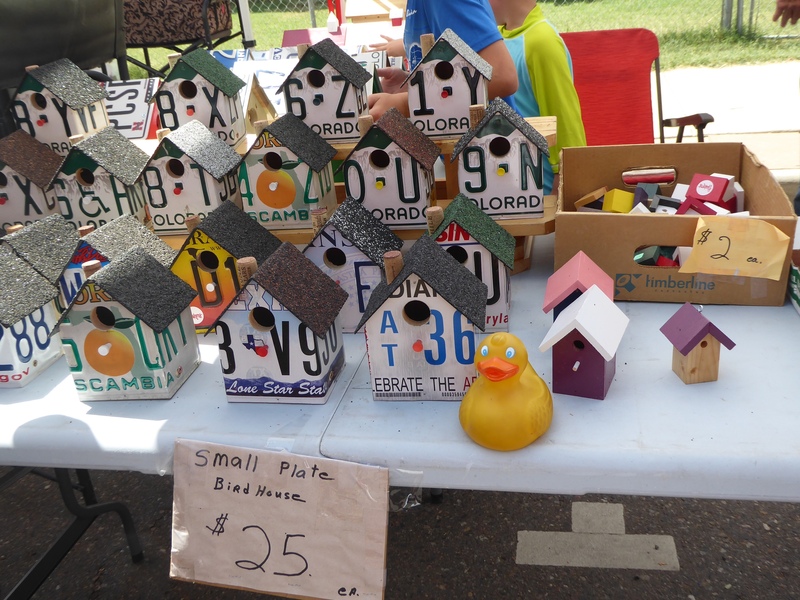 This was the first time we saw small bird houses made from old license plates. We like them! 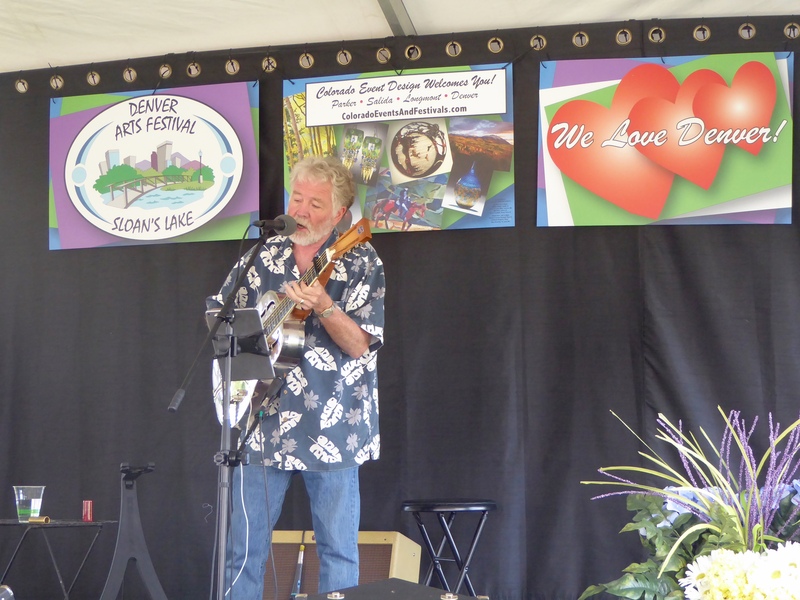 The Peach Festival in Lafayette, Colorado was fun. 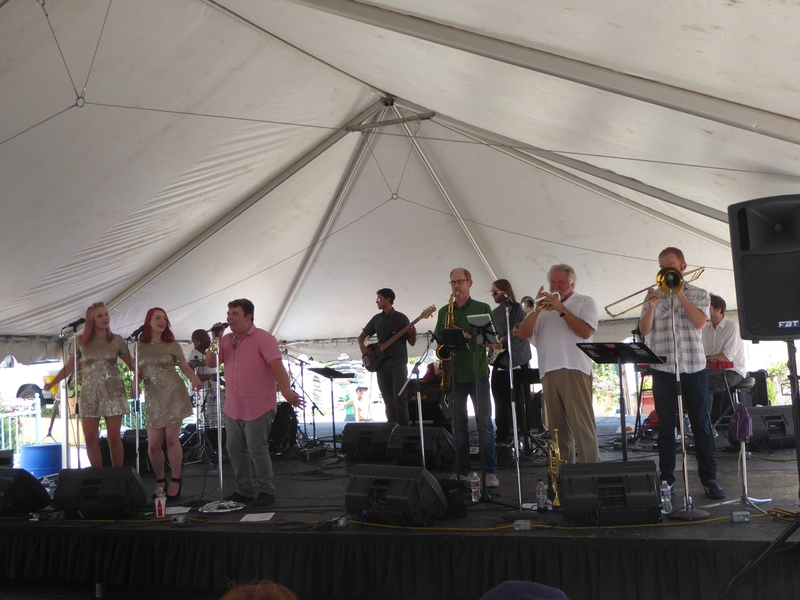 We hope you are enjoying festivals near you this summer and fall.